US 26, 3¢ dull red tied WINCHESTER / Va. // MAY / 10 / 1861 cds on cover three days after admitted to Confederacy, addressed to Joel McPherson Esq., Lewisburg, Greenbrier County [WEST] Virginia, cover with blind embossed "Insurance Company of the Valley of Virginia, Winchester Va." corner card, docketed "Insurance" at right; Confederate Use of US Postage (only 3 weeks possible), Ex Thayer, CCV $250. $300. COL. JOEL McPHERSON (1807-1888) was a Virginian, born in Loudoun County. On Christmas Day, 1835, McPherson received a commission from Governor Tazewell as colonel in the State militia, a rank he held many years. Much more information on linked page. 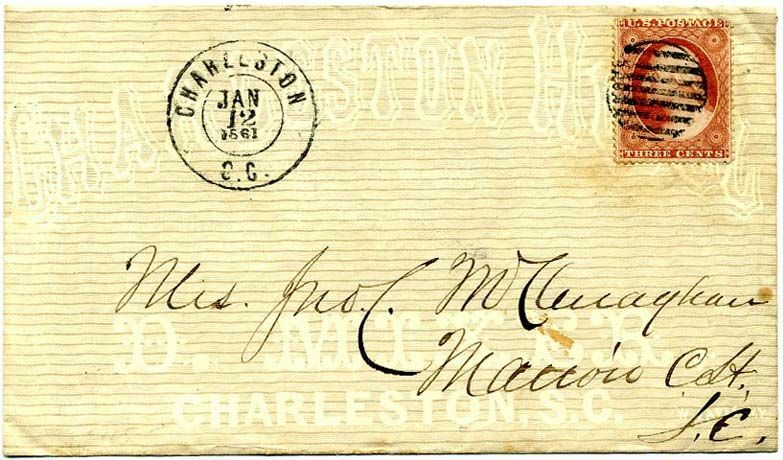 US 26, 3¢ dull red tied grid with matching beautifully struck CHARLESTON / S.C. // JAN / 12 /1 861 double circle datestamp on all-over beige CHARLESTON HOTEL advertising cover, wonderful Independent State Use addressed to Mrs. Jno C. McClenaghan, Marion C.H., S.C. SHOWY! $950. Capt. John Charles McClenaghan is cited for bravery at First Manassas in the Official Records. He was Quarter Master of Co. E, Gregg’s First, 8th SCV, 21 SCV. He died of disease on Morris Island (Charleston Harbor) March15, 1863. 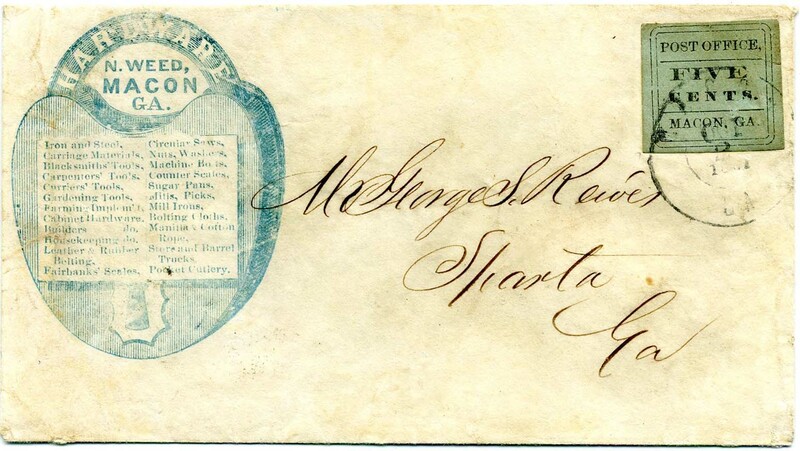 US U27, 3¢ star-die entire tied LYNCHBURG / Va // MAY / 4 / 1861 cds with blind embossed Grocers & Commission Merchant corner card of M. Hollins & Co. / No. 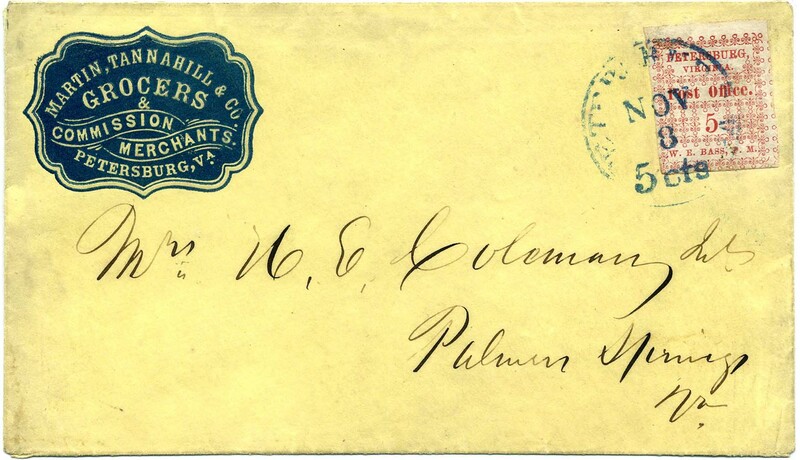 7 D Main St. / Lynchburg, Va.; addressed to Genl. 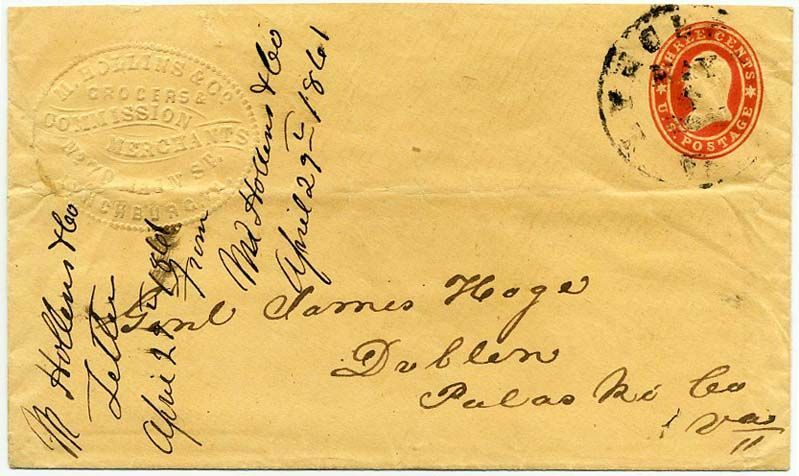 James Hoge, Dublin, Va. with contents docketing up the left side, slightly reduced at top with back flap missing, horizontal fold across bottom. Ex Thayer. Scarce Independent State Use (only independent for 20 days). CCV $300 without regard to corner card. $325. General James Hoge was commissioned Brigadier General of the 19th Brigade of Virginia Militia State Troops. Much more information on linked page. US 26, 3¢ dull red tied partial NEW ORLEANS / LA. 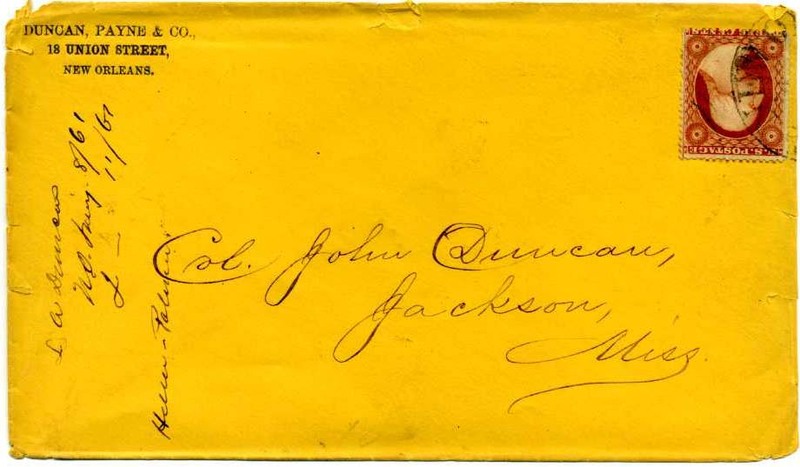 cds on cover with printed Duncan, Payne & Co., 18 Union Street, New Orleans corner card addressed to Col. John Duncan, Jackson, Miss. with docketing of contents as “L. A. Duncan, N.O. 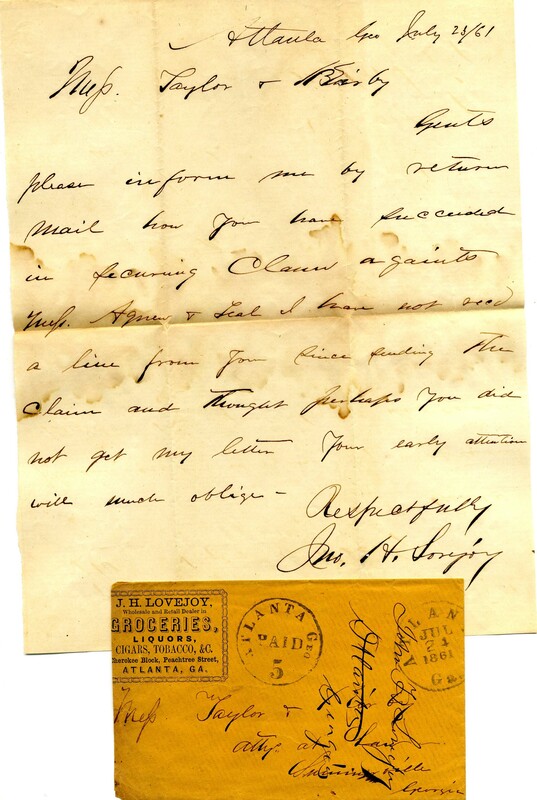 (New Orleans) Jany 8 / 61 J[ackson Jany] 11 / 61 thus received into Independent Mississippi which seceded January 9, 1861. $150. 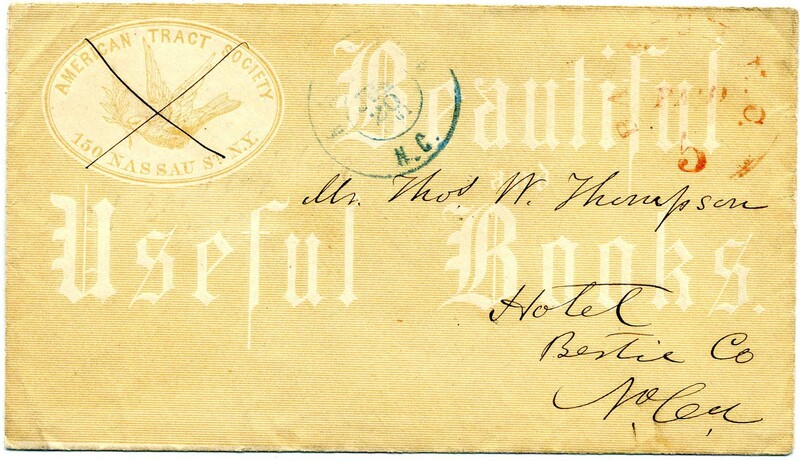 CSA 1, 5¢ green (gum stains) tied ATLANTA / Ga. // JUN / 28 / 1862 cds partly struck off top of advertising cover with printed corner card of ATLANTA HOTEL / Dr. J. Thompson, Proprietor. 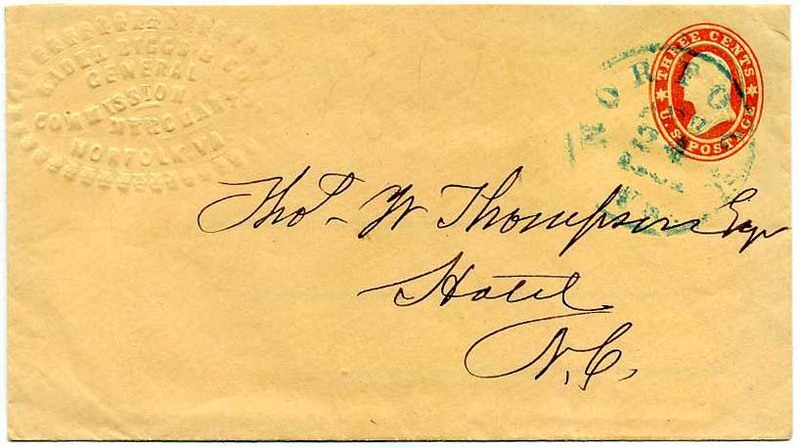 Addressed to Miss Ella Randle, Manassas, Ga. Care of T. H. Trippe Esq. The Atlanta Hotel was the largest and best hotel in town at the time and Thompson was known as a genial host. The hotel was destroyed after the Battle of Atlanta. $400. 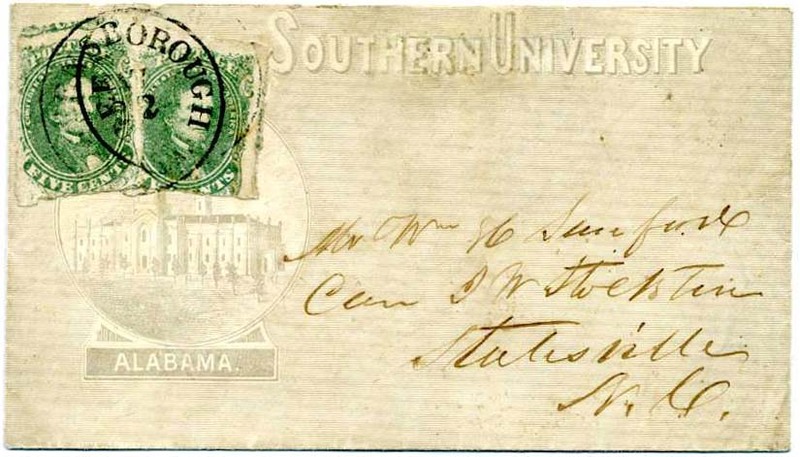 CSA 1, 5¢ green, 2 singles tied by double strike of GREENSBOROUGH / ALA. / JAN / 22 cds on all-over illuminated Southern University of Alabama college cover (CSA Catalog type AL-04, CV $1,250), addressed to “Mr. Wm H. Sanford Care J. W. Stockton, Statesville, N.C.”, professionally mended flap tears which extend to face of cover, Handsome and scarce use. Ex Tate. 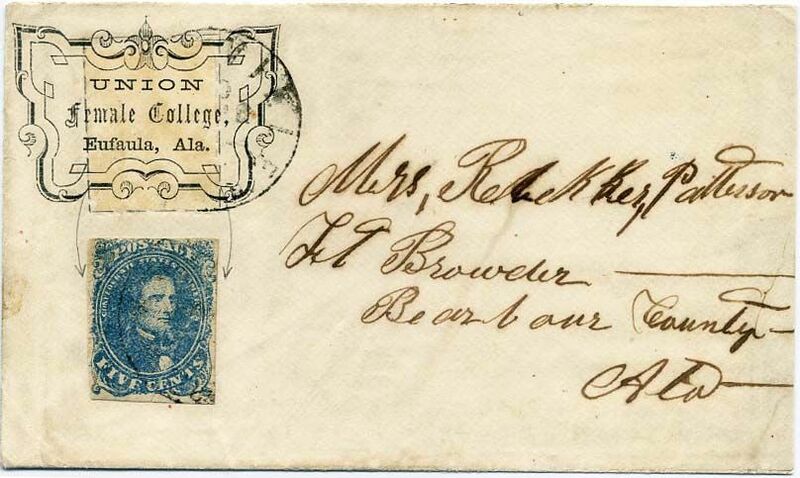 CSA 4, 5¢ blue (tiny edge tear) tied light town postmark used over UNION FEMALE COLLEGE, Eufaula, Ala. fancy printed corner card, CSA Catalog type AL-06 cataloged with a dash for the price (the cover illustrated in the listing), stamp moved aside to show full design; addressed to Mrs. Rebeckker (sic) Patterson, Ft. Browder, Bearbour (sic) County, Ala; slightly reduced at right, lightly cleaned, Scarce design. Fort Browder was home to the Fort Browder Roughs subsequently enrolled as Company D, 15th Alabama Infantry. $1,250. Fort Browder was home to the Fort Browder Roughs subsequently enrolled as Company D, 15th Alabama Infantry. Much more information on linked page. CSA 5, 10¢ rose with 4 large margins, tied by neat strike of KNOXVILLE / TEN. 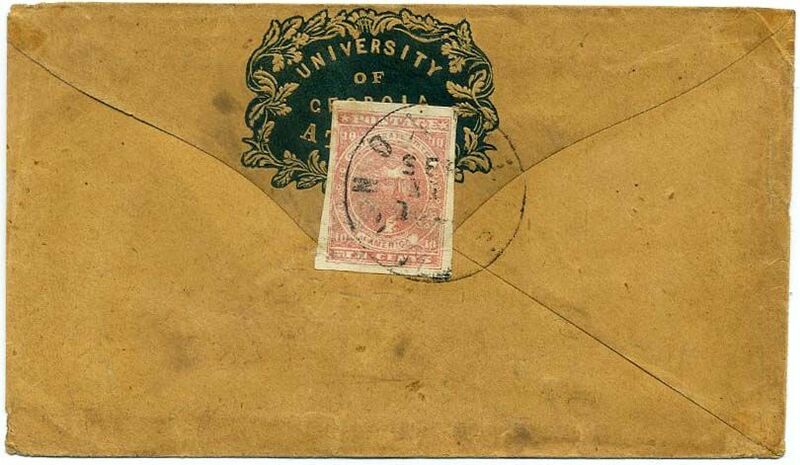 // SEP / 11 cds on back of University of Georgia at Athens embossed college cover, CSA Catalog type GA-15b (CCV $1,000 for use with most common postage, which this is not) to Jefferson Ga., various docketing and pencil notations on front, stamp affected from placement over flap with minor sealed tears and some toning, cover slightly reduced at left and bit of wear, still Fine and very scarce use of 10¢ rose. $1,500. 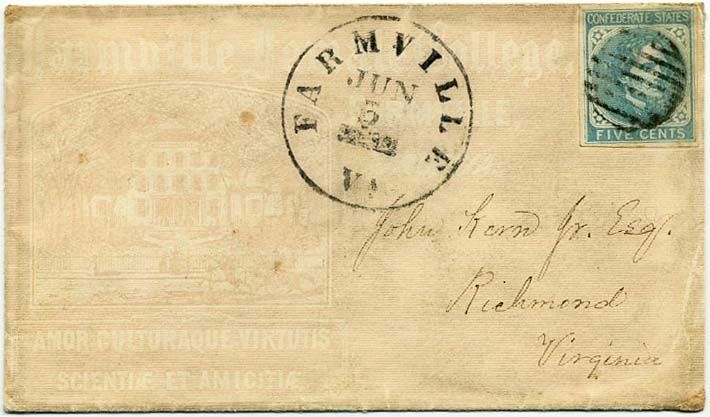 CSA 6, 5¢ light blue used on cover with grid and matching FARMVILLE / VA // JUN / 5 / 1862 cds on pink illuminated FARMVILLE FEMALE COLLEGE illustrated with a picture of the college and Latin mottoes, addressed to John Kern, Jr. Esq, Richmond, Virginia. 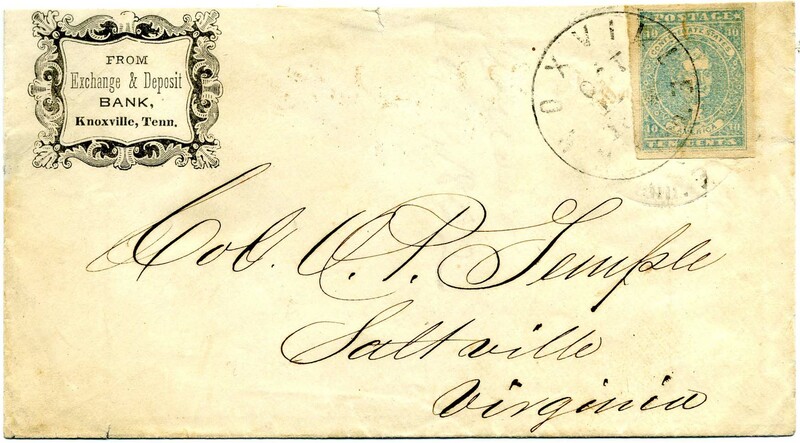 CSA Catalog VA-093 (CCV $1,500), light soiling, Very Fine choice use. $1,500. CSA 7 pair with interesting penned “frame” on right stamp, tied RICHMOND / VA. // AUG 28 / 1862 cds on Corner Card Advertising Cover of Richmond Christian Advocate, contemporary doodling on face. A charmer. $550. CSA 8, 2¢ brown red (tiny faults) tied by GREENVILLE / S.C. // JAN / ? cds on unsealed circular with "The Sunday School of South'n Bapt. 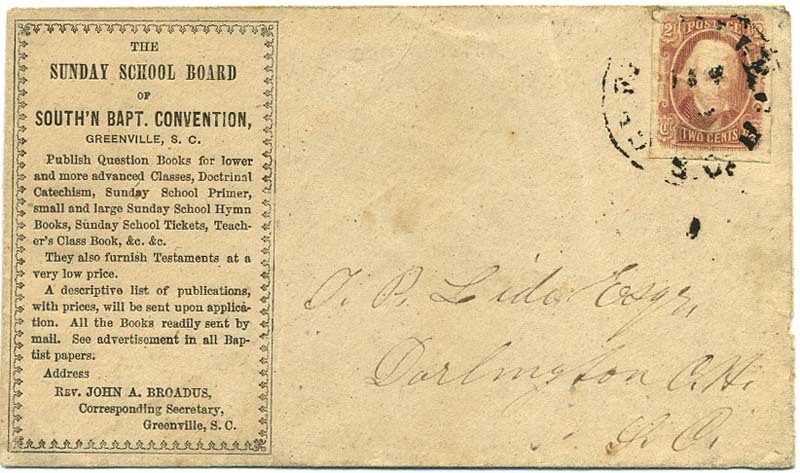 Convention Greenville S.C." corner card, addressed to T. P. Lidi, Esq. 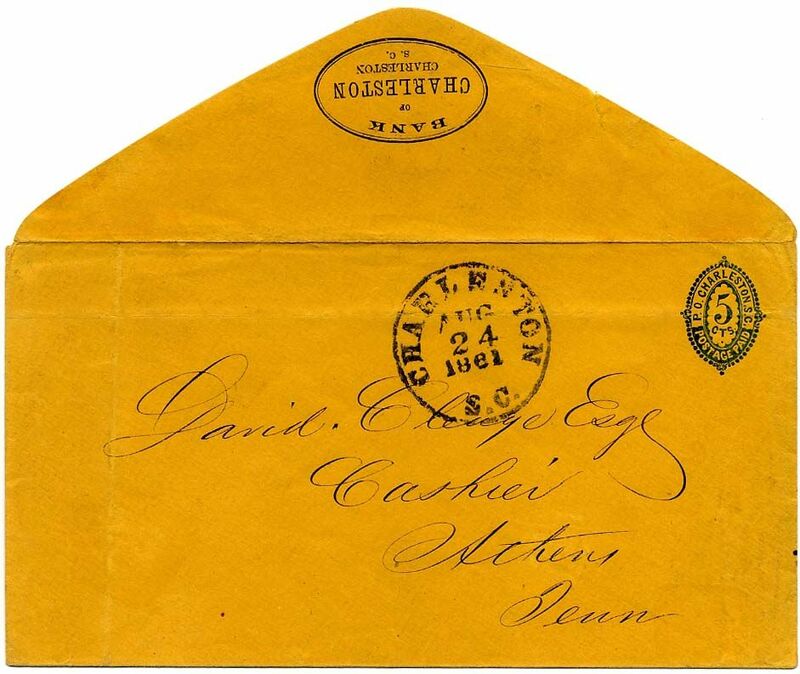 Darlington C.H., S.C.; Scarce, accompanied by 1955 letter from Stanley B. Ashbrook to dealer Raynor Hubbell attesting the authenticity of the cover and opining that it is an 1864 use, ex Kohn, Matz, and Brandon. $2,800. 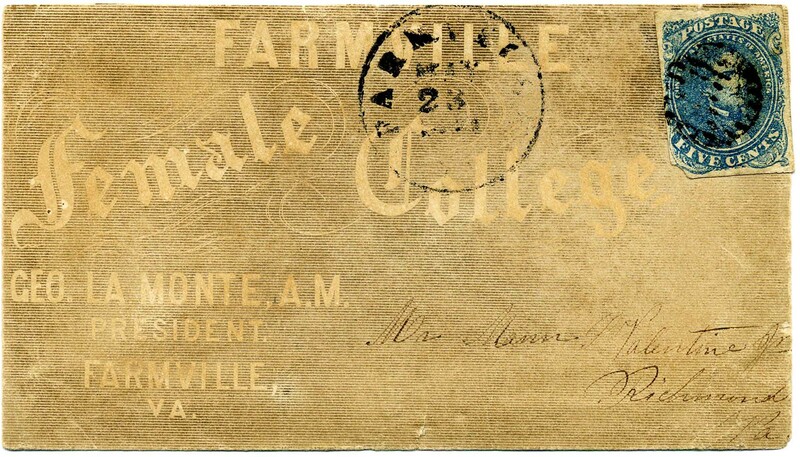 CSA 11-AD, 10¢ blue (small faults) pen canceled with matching manuscript Columbia April 23 written over Farmville Female Institute printed college corner card at left (CSA Catalog type VA-10), CV $750); addressed to Miss Lucie White, Care A. Preot (President of the school), Farmville, Virginia, ex Myerson and Morgan. $600. 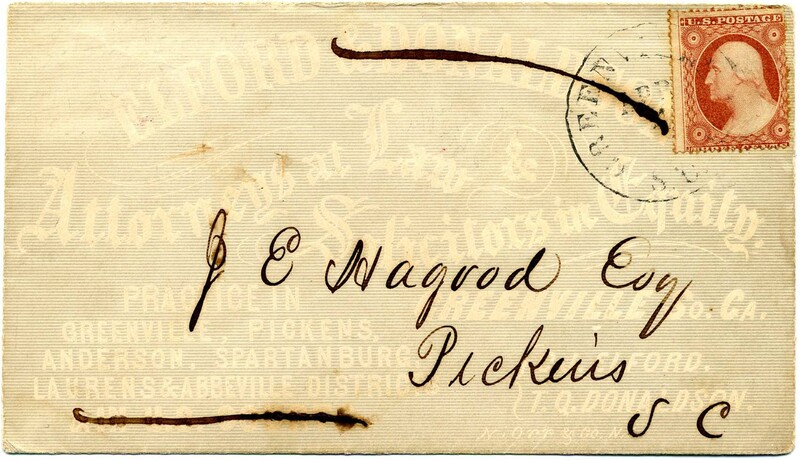 CSA 12-AD, 10¢ blue bottom imprint single showing “Bank” of Bank Note Engravers tied boldly struck JONESBOROUGH / GA // JUL / 24  cds on Warnock & Salisbury, Warehouse, Receiving, Forwarding and Commission Merchants, Columbus, Ga. corner card; addressed to Mrs. E. L. Wells, Columbus, Ga; slightly reduced at left, ex Judd. $800. 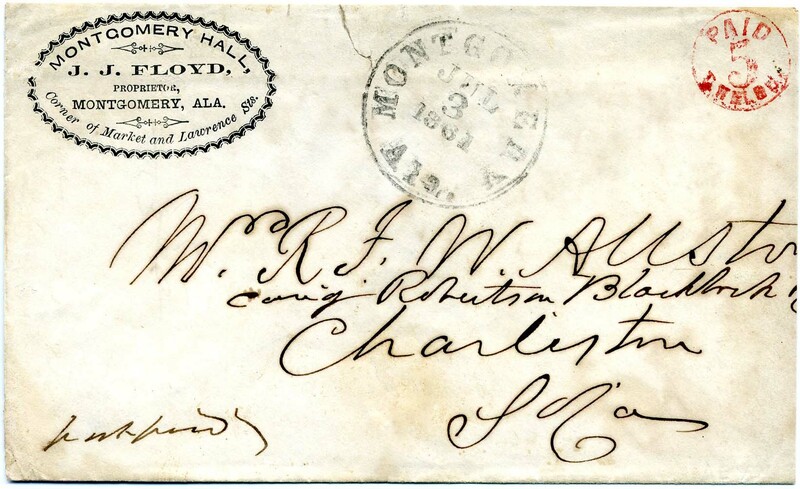 CSA 12, 10¢ blue, four large even margins, tied light GRIFFIN / GA. cds used over Pugh, Bullock & McTyer of Eufaula Ala. printed corner card cover to Miss. E. A. Merrill, Clayton, Ala. Care of B. J. Hoole; cover tears at bottom edge and top flap. $250. 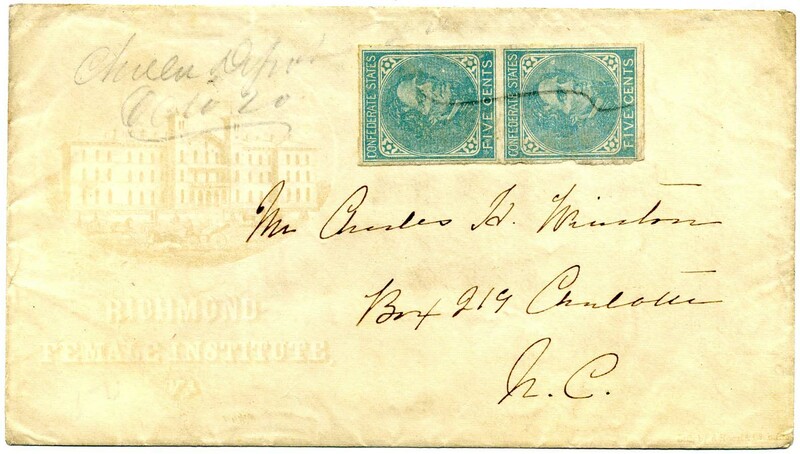 CSA 12, 10¢ blue manuscript canceled “Chula Depot, Va. June 9” on all-over pale orange college cover of Richmond Female Institute (CSA Catalog type VA-13, CV $750) to “Charles H. Winston, Esq., Box 219, Charleston, S.C.,” Very Fine. Winston was president of the college. $600. MILLEDGEVILLE / GA. // MAR / 12 cds with matching PAID and 5 rating handstamps, on Compton & Callaway, Family Groceries, Millidgeville (sic) Ga., blue embossed CAMEO CORNER CARD on cover addressed to John B. Lam, Macon Ga., slightly reduced at right. $800. LEXINGTON / Va. // DEC / 5  cds with matching PAID 5 used on an all-over gray attorney card card of Greenlee Davidson. 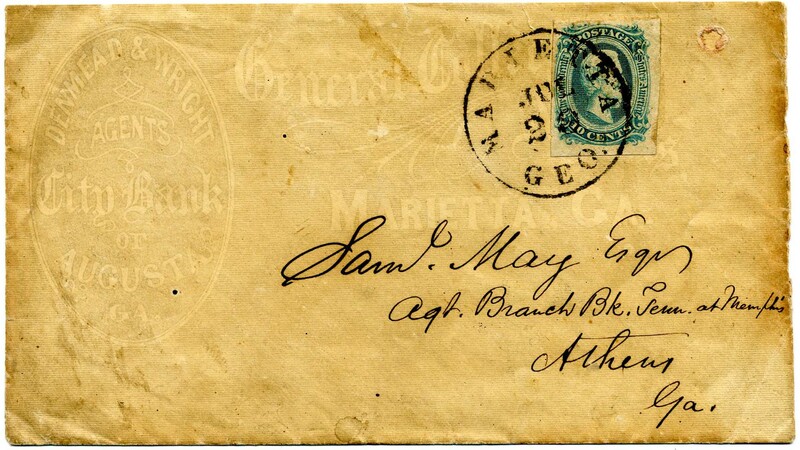 These same markings were used both as stampless and postmaster provisional, the latter considered as provisional markings only when unused, under a postally used general issue, or mailed from another town. 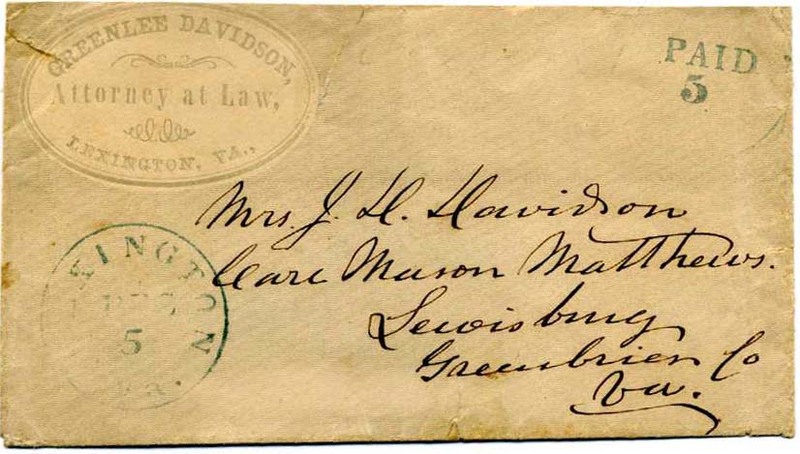 Top back flap missing, slightly reduced at top and couple tears at upper left; addressed to Mrs. J. D. Davidson Care Mason Matthews, Lewisburg, Greenbrier Co [West] Va. $350. 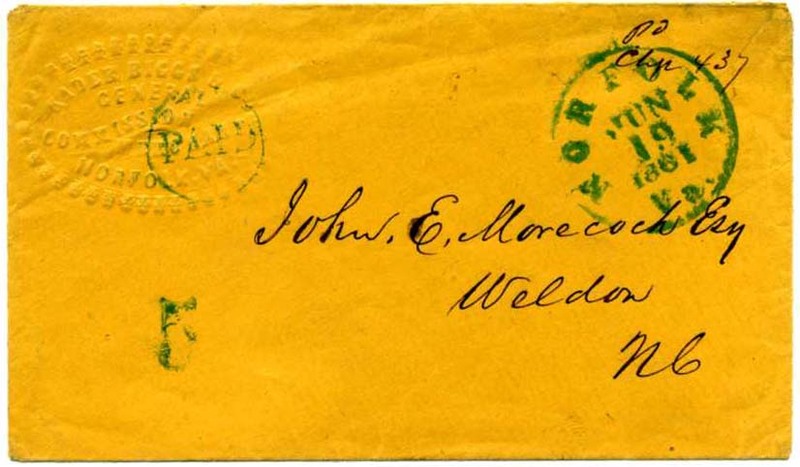 NORFOLK / VA. // JUN / 19 / 1861 blue cds with matching handstamped "PAID" in circle and "5" rate on attractive clean blind embossed merchant corner card cover to “John E. Morecock Esq., Weldon, N.C.”, Very Fine. $425. 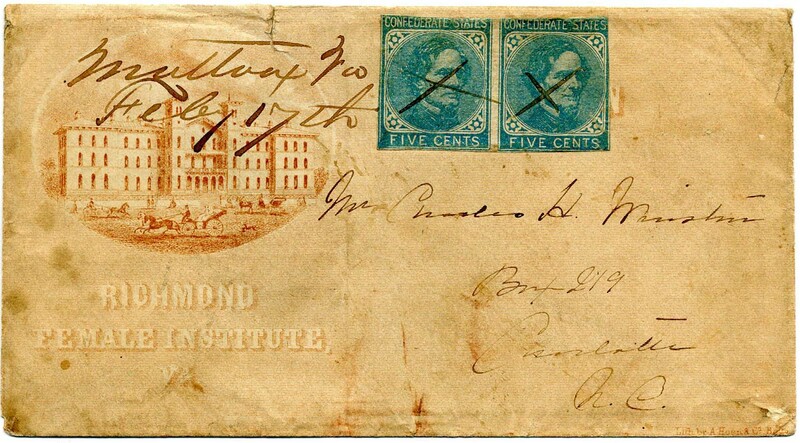 Charleston S.C., 5¢ Blue on orange #16XU3press-printed provisional entire, bold strike of Charleston S.C. Aug. 24, 1861 cds, sent to David Cleage, Esq., Athens Ga., BANK OF CHARLESTON ADVERTISING OVAL on top back flap, light file folds one of which affects design, ONLY RECORDED EXAMPLE OF THE 5¢ CHARLESTON PROVISIONAL ENVELOPE WITH ADVERTISING RETURN CARD. Displays beautifully with flap up. Ex “Walter Carroll” and Creighton Hart. $2,500. Listed in both Provisional and Advertising Cover Sections. 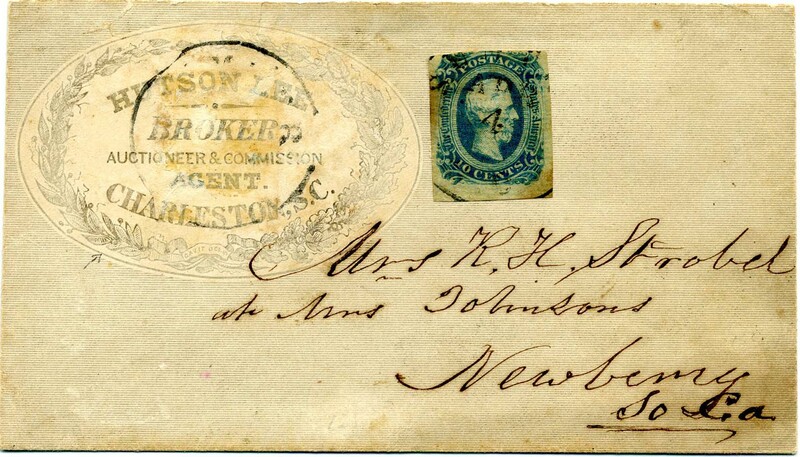 Charleston S.C., 5¢ Blue #16X1 with mostly large but irregular margins showing large parts of outer frame lines, slightly in where unevenly separated, tied by Charleston S.C., Nov. 5, 1861 cds on J. N. ROBSON COMMISSION MERCHANT'S CORNER CARD cover to Concord N.C.; Fine, a scarce corner card cover, the Calhoun census lists approximately fourteen examples on corner card covers, but many are embossed and do not clearly show the design. $1,500. Petersburg, Va. 5¢ red #65X1, position 10, tied by blue PETERSBURG / VA. // 5CTS. 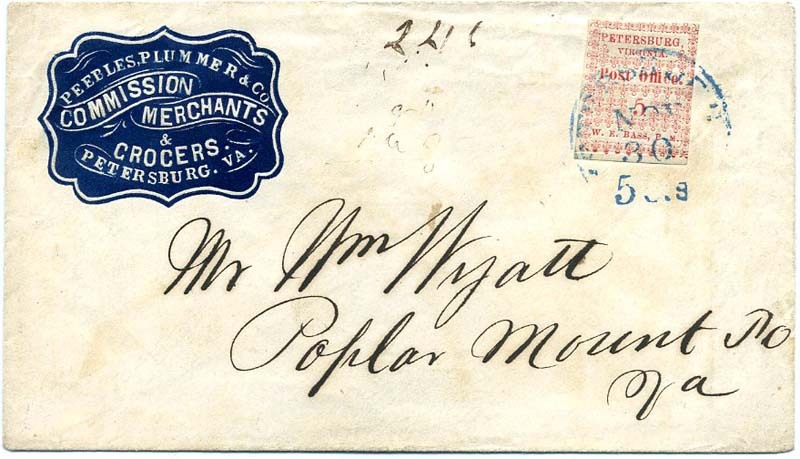 / NOV / 30  integral-rate cds on Peebles, Plummer & Co. grocer and commission merchant's blue cameo corner card cover to Wm. Wyatt, Poplar Mount P.O. Va., stamp with pre-use crease at bottom, SCV $2,500 without premium for the corner card. Ex Powell. A beauty! $2,500. 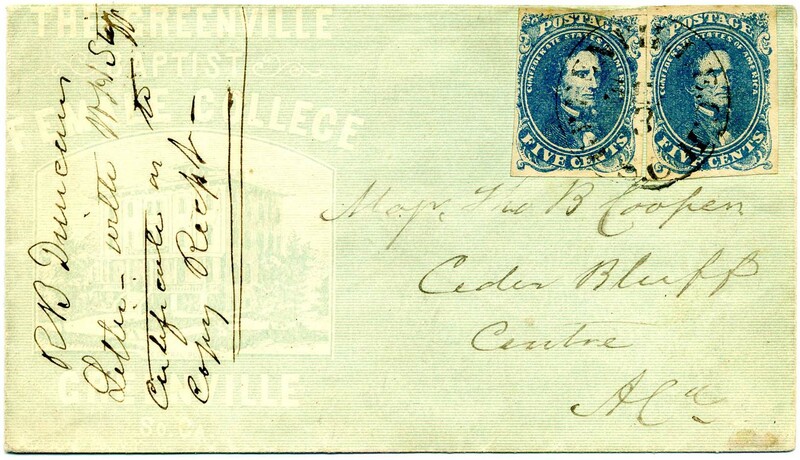 CSA 4, 5¢ blue, (two singles), “Stone 3” noted on verso but not verified by me, large margins, tied together by light GREENVILLE / S.C. // SEP / 3 cds on light green Greenville Baptist Female College all-over illustrated college cover (CSA Catalog type SC-01b with CV of $1,500 for more common stamps) to Major Tho[mas’ B. Cooper, Cedar Bluff, Centre, Ala., docketed at left as from R B Duncan with W. H. Stiff’s certificate, slightly reduced at top and missing small part of top flap, Very Fine. This may be the Thomas B. Cooper who was Speaker of the Alabama House of Representatives in 1867. More research needed. Cedar Bluff, AL, and Centre, AL, are about 6 miles apart. A lovely fresh college cover. $1,350. 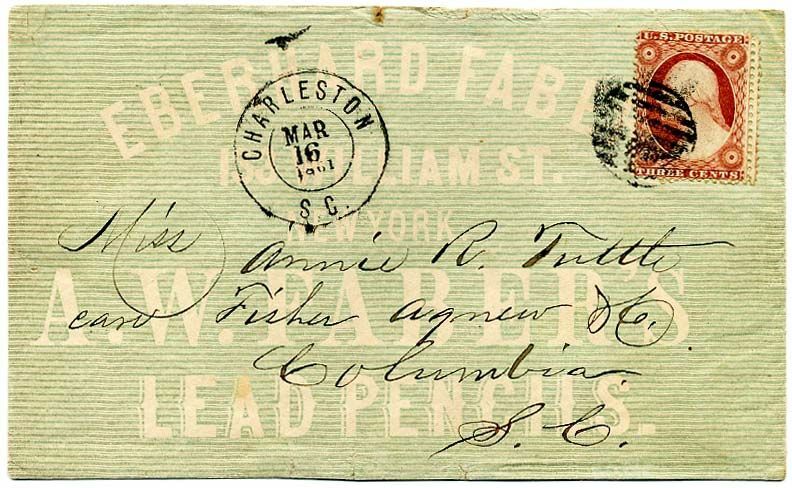 U.S. 3¢ dull red #26 (double perfs at right, small faults) tied grid with matching dc postmark of CHARLESTON / S.C. // MAR / 16 / 1861 on all-over green illuminated Eberhard Faber Lead Pencil Manufacturer’s advertising cover, addressed to Annie R. Tuttle, Care Fisher Agnew, Columbia, S.C.; slightly reduced at left and tiny sealed upper left corner tear, Showy Confederate State Use of US Postage. $1,200. RICHMOND / Va. // JUL / 6  with matching PAID 5 Cts double-line handstamp on all-over green Harvey, Armistead & Williams, Whole Grocers illuminated advertising cover, opening tears across top. Ex Cox. $450. Wharton and Petsch Car Works produced rail cars from 1850-18? ?, according to online sources. 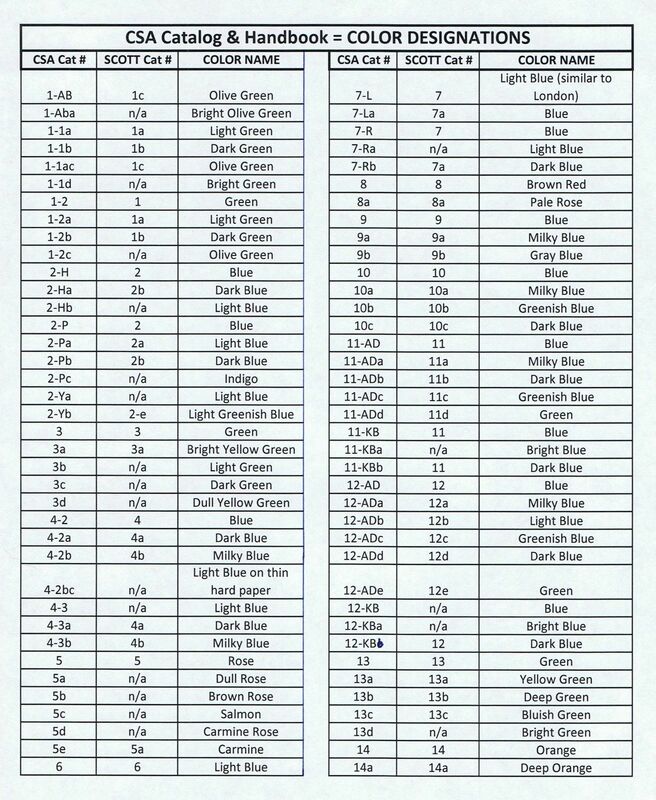 Detailed information on linked page. 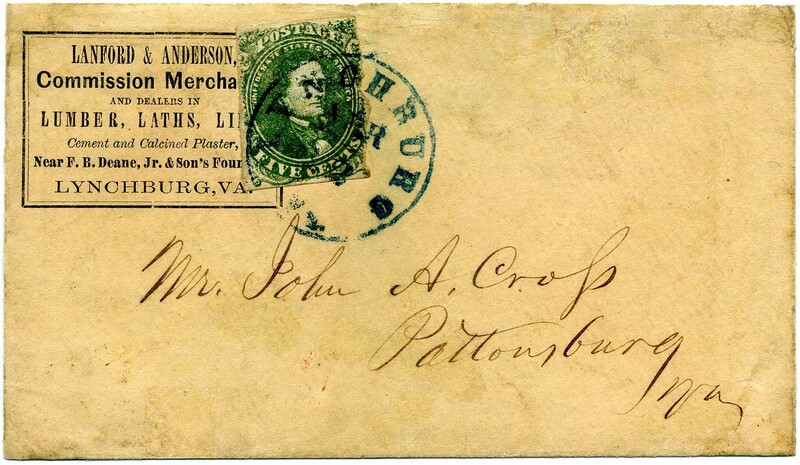 CSA 1-AB, 5¢ olive green, uncanceled but unquestionably belongs according to Hendershott who acquired it with other Kern correspondence. 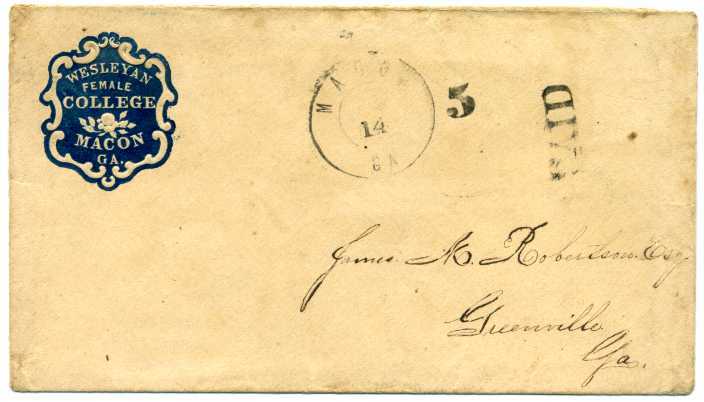 Stamps were usually canceled with a grid and it simply missed this step. 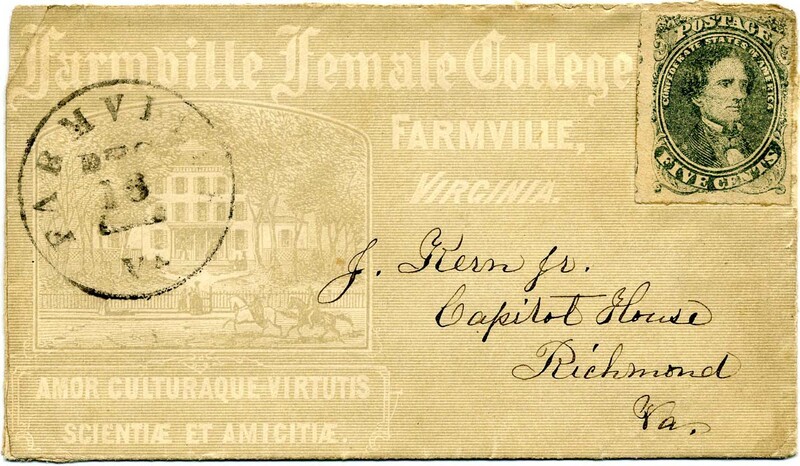 Town postmark of FARMVILLE / VA. // DEC / 16  used on illuminated all-over college cover showing the college, Farmville Female College, CSA Catalog type VA-09e with catalog value of $1,500. 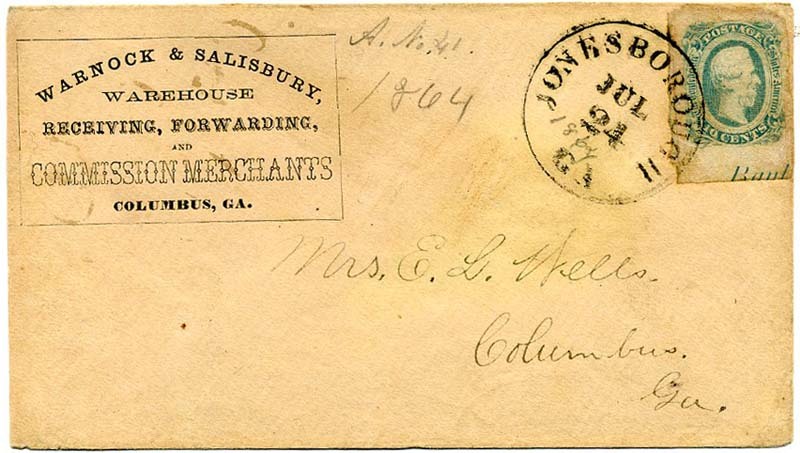 Strongly addressed to J. Kern Jr. Capitol House, Richmond, Va., open 2 sides. Ex Littlejohn and Plantation Collection. $1,500. 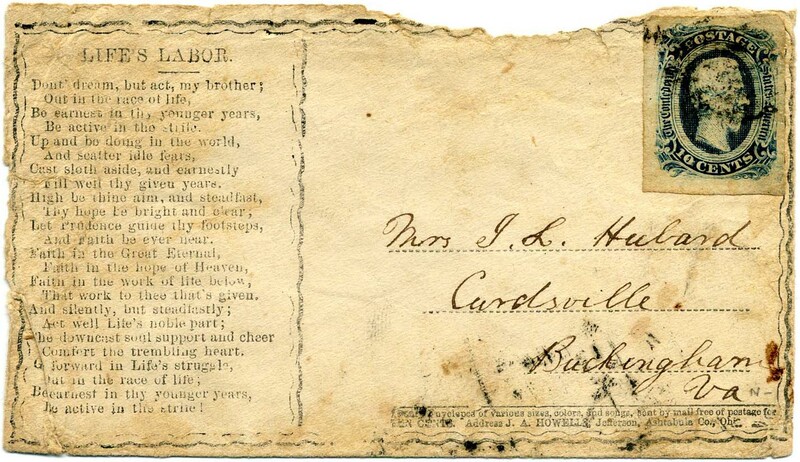 CSA 12-KB, 10¢ dark blue (4 margins) used with army field cancel on Howell’s Poems printed envelope “Life’s Labor” with full verse, addressed to Mrs. J. L. Hubard, Curdsville, Va. Large part of flap missing, which extends over the top of the cover. Ex Plantation Collection. $200. James Lenaeus Hubard served in Virginia 44th Infantry and was Major and Quartermaster for Robertson’s Cavalry. Detailed information on linked page. 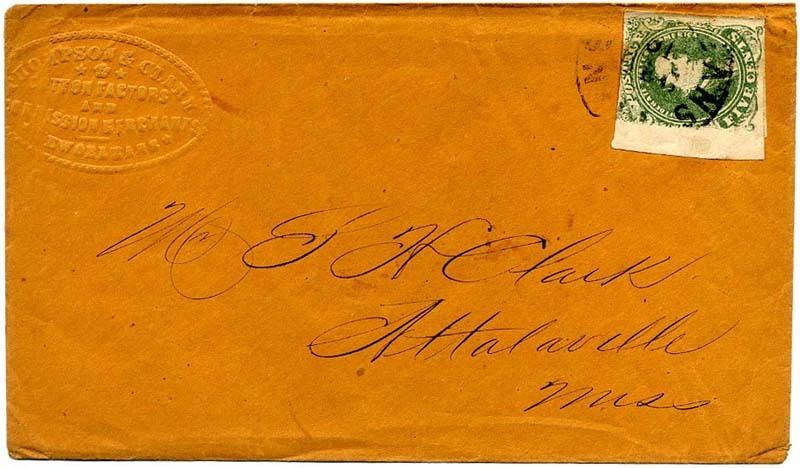 CSA 1c, 5¢ olive green left sheet margin single tied NEW ORLEANS / LA on embossed corner card cover of Thompson & Clark / Cotton Factors / Commission Merchants / (N)ew Orleans to J H. Clark, Attalaville, Miss, opening tear in top back flap. $325. CSA 11, 10¢ Blue, full to large margins, tied by CULPEPPER C.H. / VA. // 18 / AUG cds on cover with Atlantic & Ohio Telegraph imprint, the "Connecting with all parts of the United States" changed in manuscript to "Confederate", addressed to Mrs. Mary Lew Lackey, Lexington Va., where FORWARDED to Fancy Hill with manuscript "Forwd 10" rate and blue LEXINGTON / VA. // AUG / 21 cds, reduced at left bit into design, rare Confederate telegraph cover, ex Keeling. $975. 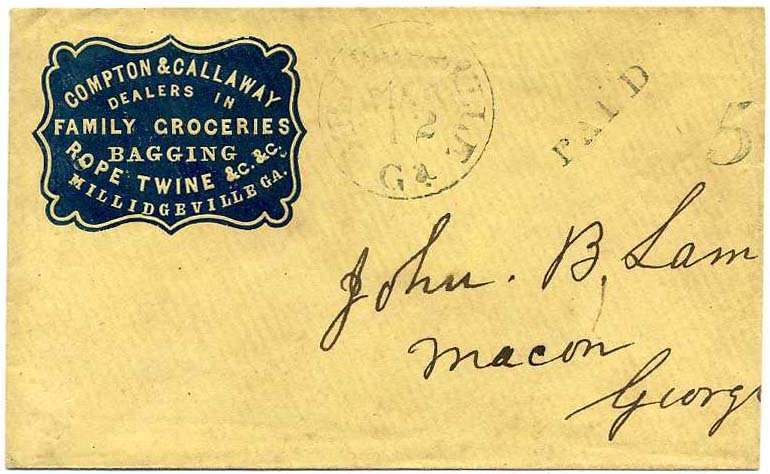 AUGUSTA / GA // JUN / 24  double circle datestamp with matching PAID 5 (CSA Catalog Type B, CCV $200 for regular use) on cover with elaborate blue embossed cameo corner card of Baker & Caswell, Wholesale Grocers. 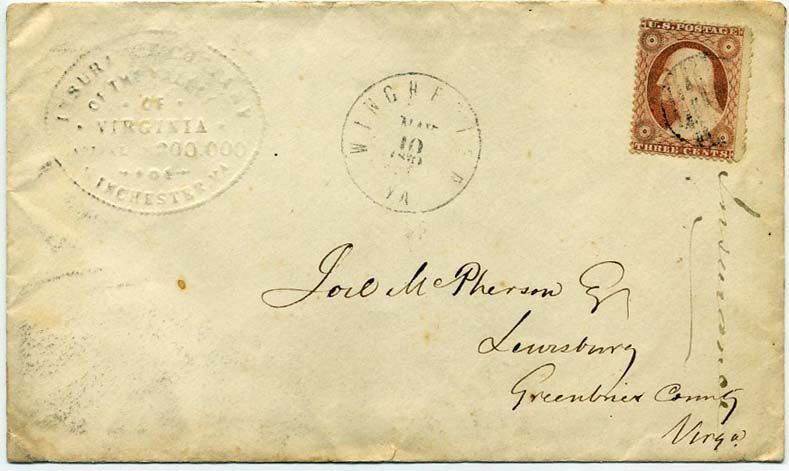 CSA Vice President Alexander H. Stephens correspondence addressed to Crawfordsville, Geo; top back flap missing as is usual with this correspondence, contents docketing on verso to send bill of bacon for Mrs. Perkins; large tear along left side sealed with archival tape. $200. 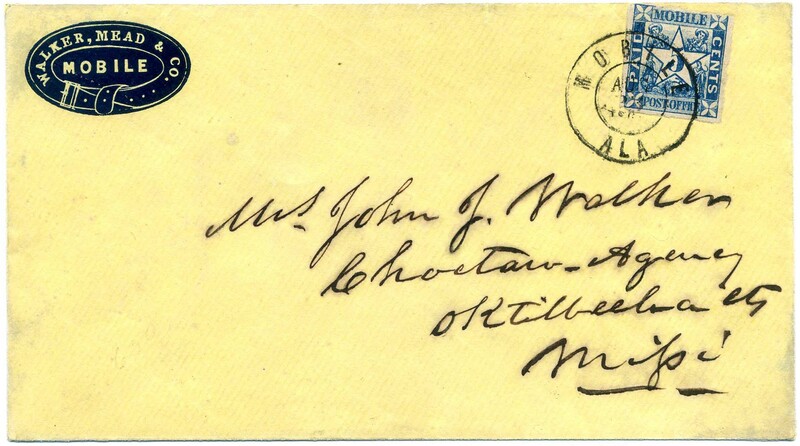 CSA 12a, 10¢ milky blue tied SUMTER / S.C. // APR / 4 cds tied over all-over illuminated corner card of Hutson Lee, Brokers, Auctioneers and Commission Agent, Charleston, S.C.; addressed to Mrs. R. H. Stroke at Mrs. Johnsons, Newberry, So Ca. Among other things, Hutson Lee was a slave trader and auctioneer; his business was no longer operating at this date. ONLY 3 OF THIS DESIGN RECORDED. Top back flap missing and couple small sealed tears at top. Stamp moved to the side to display the corner card. Ex Kohn and Wayman. $1,200. 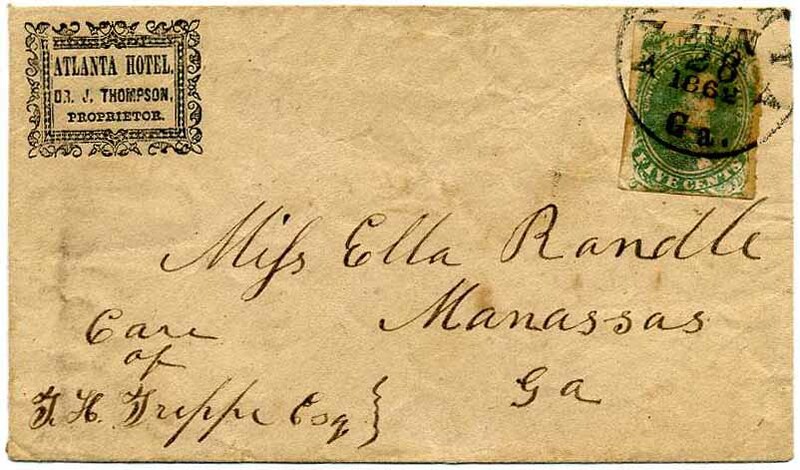 US 26, 3¢ dull red with IMPRINT in the left margin (small faults) tied grid with matching CHARLESTON / S.C. // MAR / 13 / 1861 cds on advertising cover with green cameo of Geo. 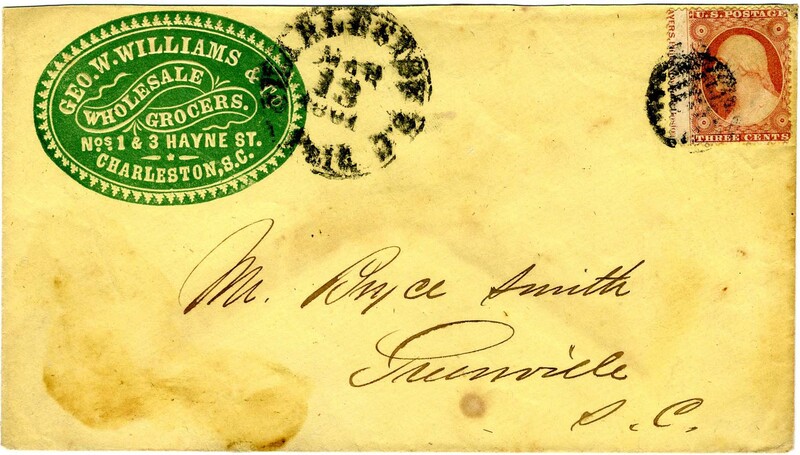 W. Williams & Co., Wholesale Grocers; top back flap missing and bit stained; CSA Use of US Stamps, to Bryce Smith, Greenville, S.C. $400. 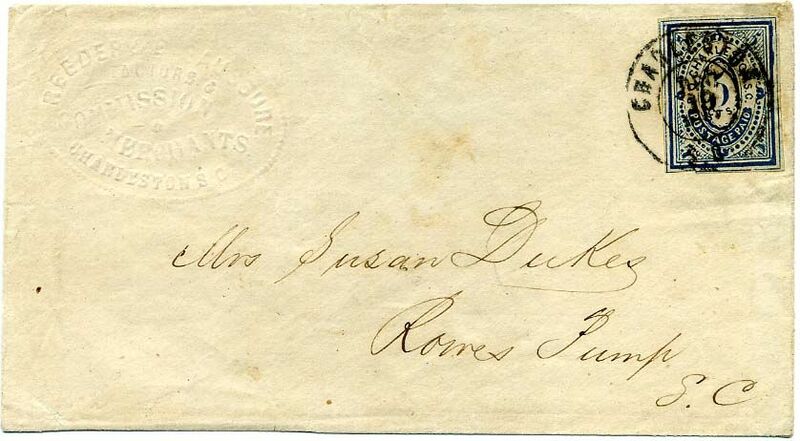 US 26, 3¢ dull red with IMPRINT in the left margin (small faults) tied CHARLESTON / S.C. // APR / 18 / 1861 cds on advertising cover with brown cameo of Geo. 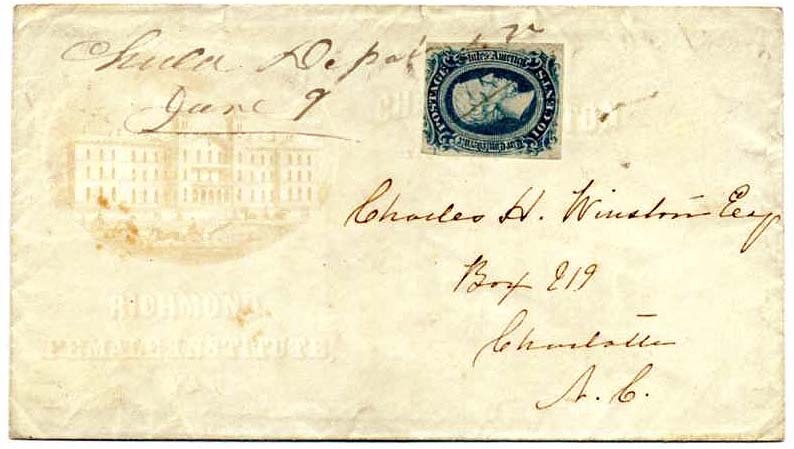 W. Williams & Co., Wholesale Grocers; top back flap missing, vertical crease and bit stained; CSA Use of US Stamps, to W. W. Renwick, Pomaria, S.C. $350. 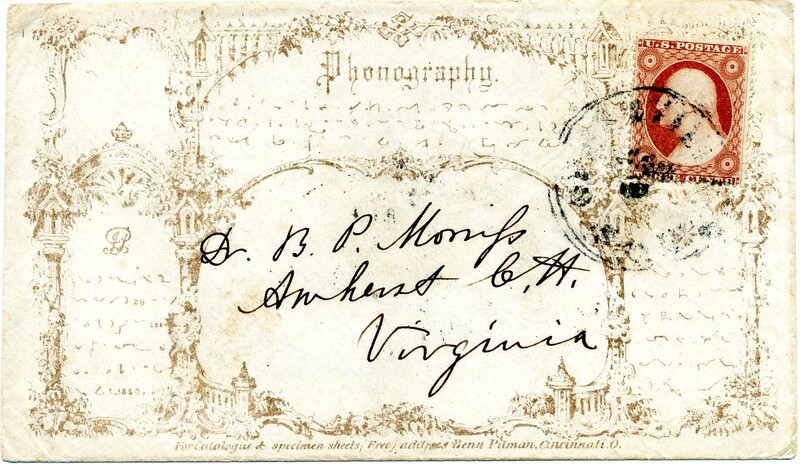 US 26, 3¢ dull red #26 tied by blurry GREENVILLE / S.C. // JAN / 6 /  cds on all-over illustrated phonography (shorthand stenography developed by Isaac Pitman) cover to Dr. B. P. Morris, Amherst, Virginia. 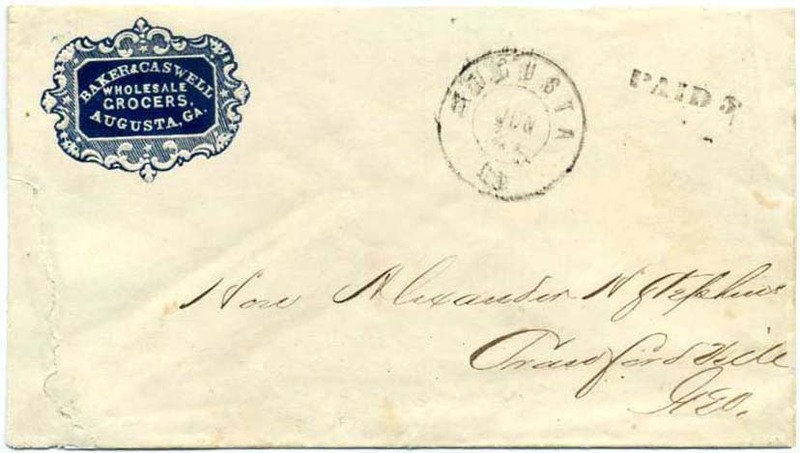 EXCELLENT ORIGINAL LETTER headed Jany 5, 1861 from Jos. S. Brown saying, in part, “I will send you a copy of the Charleston Mercury from which you may see the spirit of this state. I am a decided Unionist, under present circumstances. I believe that the Northern mind is incurably diseased upon the subject of slavery & that no comprise which we may make with them will be regarded by them so as to be of any permanent benefit to the South. Now is the time to achieve our independence of a fanatical Northern majority. 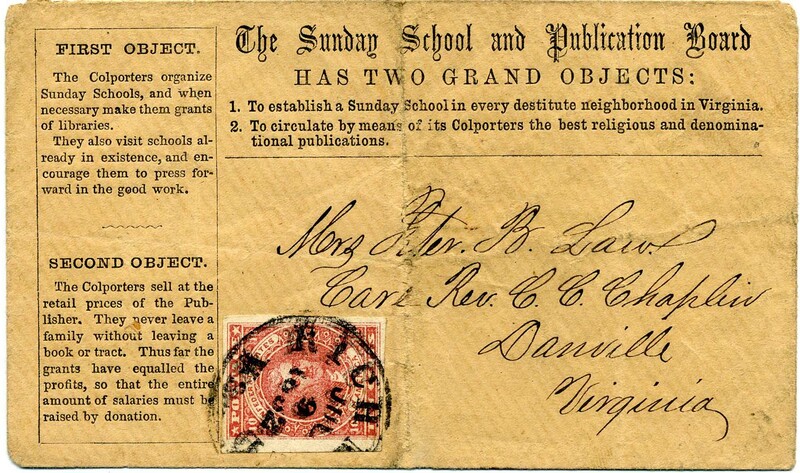 Our number has reached 35 at the Seminary, ten from Virginia.” Sealed tear at top of letter; spectacular cover. $750. 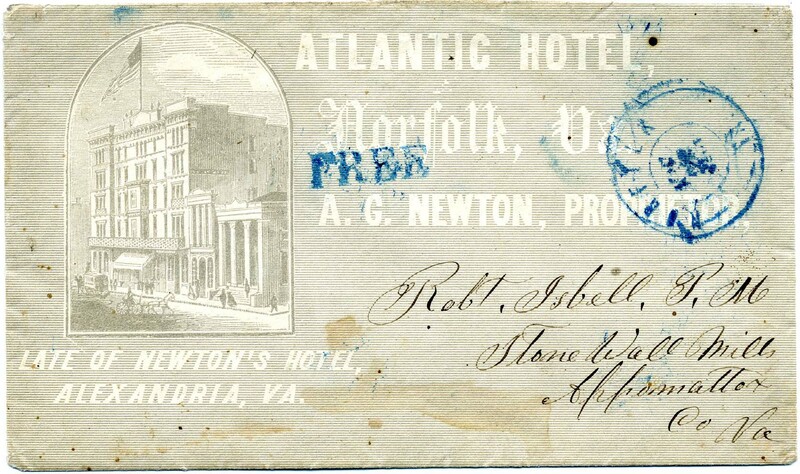 NORFOLK / VA // APR / 22 / 1861 blurry strike of blue double-circle datestamp with matching "FREE" straightline on all-over lithographed Atlantic Hotel illustrated advertising cover to Postmaster Robert Isbell, Stone Wall Mills, Va., William Murphy N.Y. imprint on flap which is torn but intact, minor staining at bottom, Very Fine and scarce Independent State use on an advertising cover; Virginia seceded less than a week before this was mailed. $1,200. US 26, 3¢ dull red straddle margin #26 tied GREENVILLE / S.C. // APR / 4 /  cds on all-over advertising cover of Elford & Donaldson, Attorneys at Law & Solicitors of Equity. 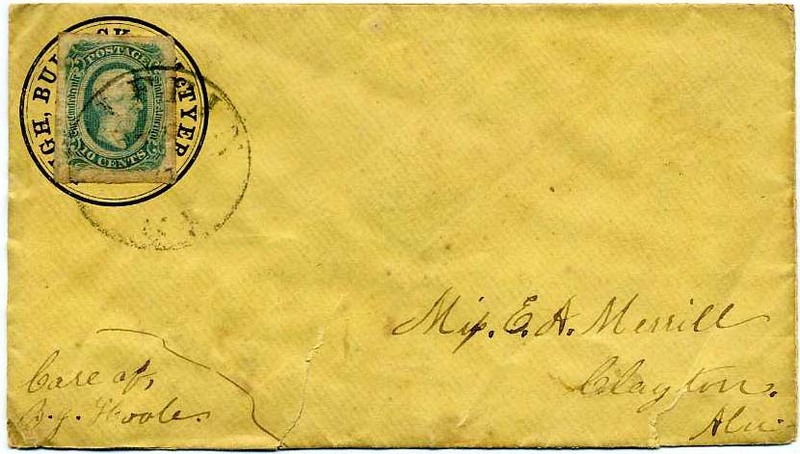 At the bottom of cover, the printed “In U.S. Courts” and “Donaldson” have been crossed out contemporaneously, leading to accurate speculation that this is Confederate Use of U.S. Postage; it is addressed to J. E. Hagood, Pickens, SC. Docketing on the verso shows this as sent from C. J. Elford. Dating of 1861 is confirmed by research that Thomas Quinton Donaldson was in practice with his preceptor, Charles J. Elford, until 1861. Military records confirm that on April 13, 1861, he joined the Butler Guards, Capt. A. D. Hoke’s Co. B, SC 2nd Infantry—the day after the firing on Ft. Sumter. He saw active service in Virginia, including the first battle of Bull Run, until failing health compelled him to retire May 12, 1862. Soon after returning home, he was appointed collector of the war tax for Greenville County, and discharged the duties of that office until the close of hostilities. AD DESIGN UNLISTED IN CSA CATALOG. Thomas Quinton Donaldson bio Ex Daniel C. Warren. $750. FORT DEPOSIT / ALA. // MAY  blurry cds and PAID (no rate). Not so listed in CSA catalog (usually a ms. rate). 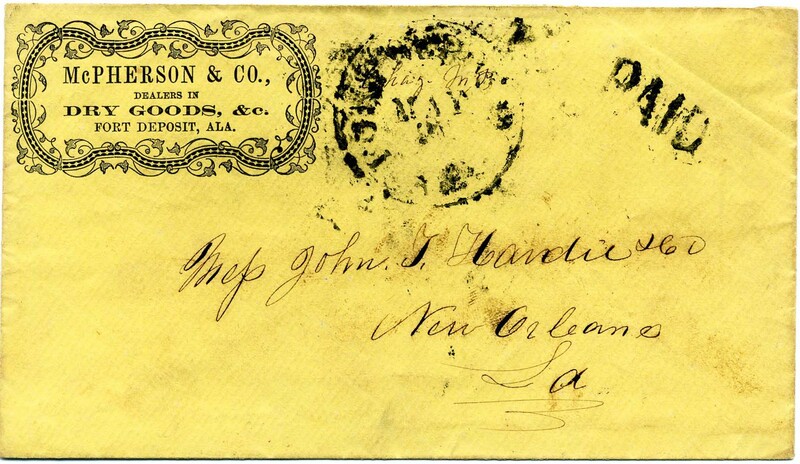 On fancy letterpress corner card of McPherson & Co. Dry Goods , Fort Deposit, to Mess John T. Hardie & Co, New Orleans. Ad design listed in CSA catalog. $400. 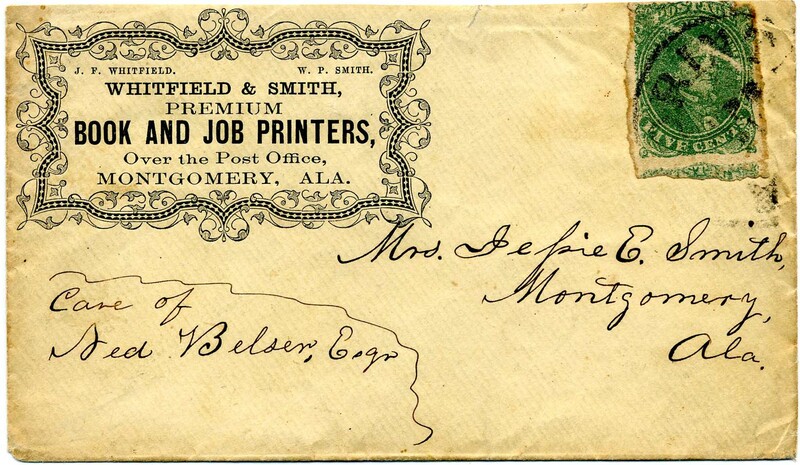 CSA 1, 5¢ green (faint diagonal scrape) tied by light CORINTH / MISS balloon postmark (37 mm) on ornate letterpress corner card of Whitfield & Smith, Premium Book and Job Printers, Over the Post Office, Montgomery, Ala., to Mrs. Jessie E. Smith, Montgomery, Ala., Care of Ned Belen, Esq. ; bit reduced at top with tiniest sealed edge tear and part of back flap removed. AD DESIGN NOT LISTED IN CSA CATALOG, THREE LISTED IN BAUM CENSUS. $500. CSA 1, 5¢ bright green tied by blue LYNCHBURG / Va. // APR / 12  cds on Lanford & Anderson, Commission Merchants and Dealers in Lumbers, Laths, Lime, Cement and Calcined Plaster, Near F. B. Beane, Jr. & Sons Foundry, Lynchburg, Va. Most of back flap removed. AD DESIGN NOT LISTED IN CSA CATALOG, THREE LISTED IN BAUM CENSUS. $600. CSA 2-Y, 10¢ light milky blue (4 large even margins), tied neat KNOXVILLE / Ten. 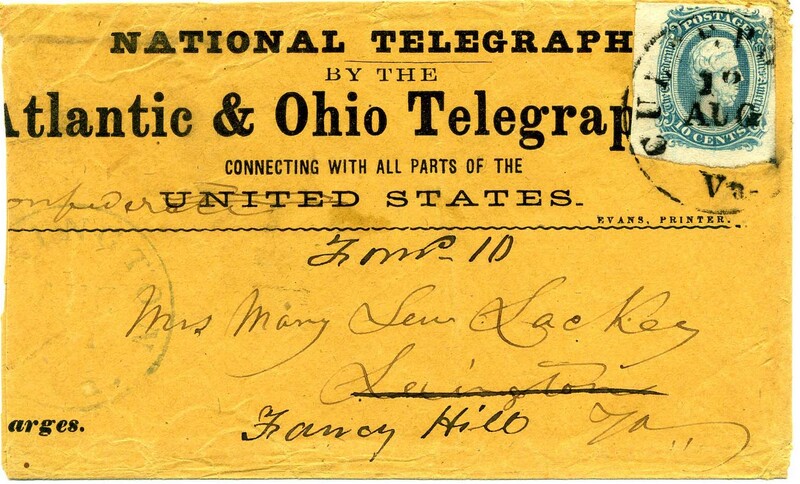 // OCT / 10 / 1862 cds on fancy printed Exchange & Deposit Bank, Knoxville, Tenn., to Col. O. P. Temple, Saltville, Virginia. slightly reduced at top and sealed flap tears. $950. Oliver Perry Temple was a lawyer and a Unionist. Much more information on the linked page. 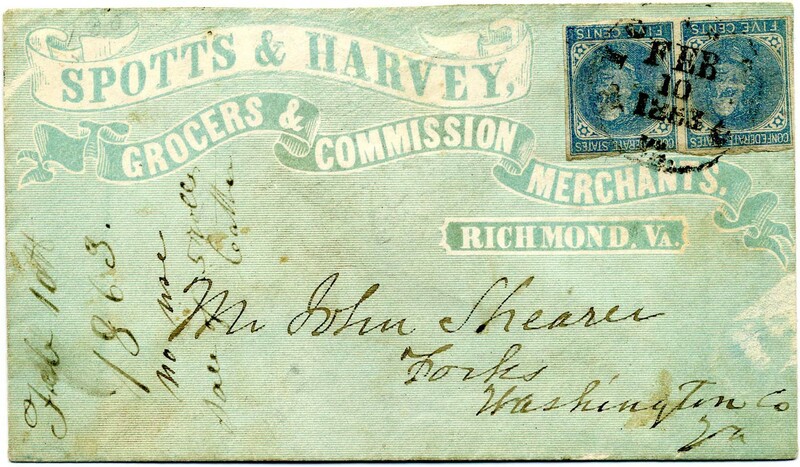 CSA 7-R, 5¢ blue pair tied RICHMOND / Va. // FEB / 10 / 1863 cds on all-over green illustrated SPOTTS & HARVEY Grocers & Commission Merchants ad cover to John Shearer, Forks, Va. Slightly reduced at top with part of top back flap missing, Ex Kohn and D.C. Warren. $750. 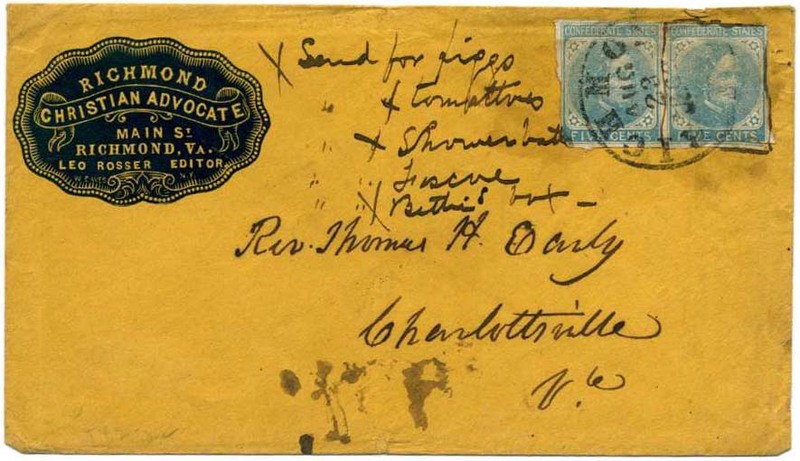 CSA 7-R, 5¢ blue pair (small faults) tied NATCHEZ / Miss cds on fancy illustrated letterpress ad cover of Direct Importation, Chas. 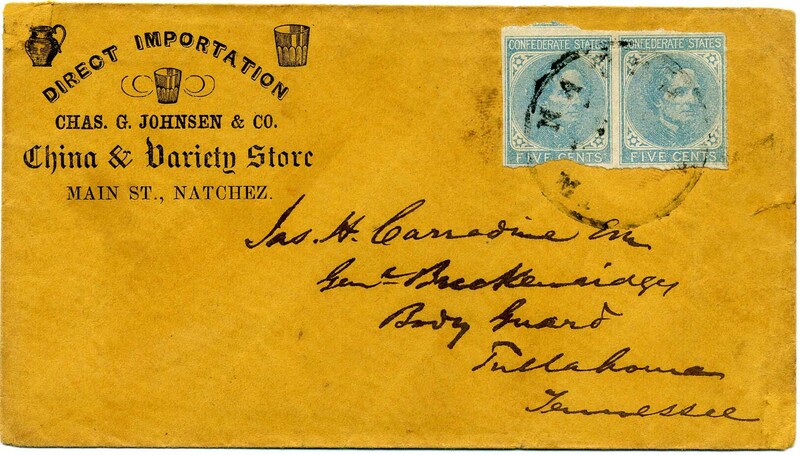 G. Johnsen & Co., China & Variety Store, Main St., Natchez, addressed to Jas. H. Carradine Esq, Genl Breckenridge's Body Guard, Tullahoma, Tennessee. Tiny fault at upper left and sealed tear at right. Rare to see body guard in the address, also rare ad design—THE ONLY ONE RECORDED IN THE BAUM AD CENSUS and only one of two CSA ad covers from Natchez. $950. Sgt. James H. Carradine served in Co. C. Mississippi Buck’s Cavalry. Much more information on the linked page. 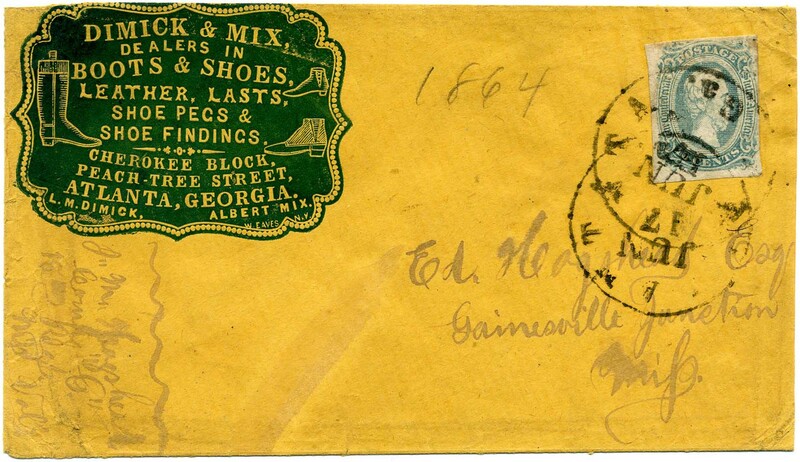 CSA 11, 10¢ blue (2 margins) tied double strikes ATLANTA / Ga. // JUN / 17  cds on cover with large green embossed illustrated cameo corner card of Dimick & Mix, Dealers in Boots & Shoes, Leather, Lasts, Shoe Pecs & Shoe Findings, Cherokee Block, Peach-Tree Street, Atlanta, Georgia, L.M. Dimick, Albert Mix with tiny “W. Eaves NY” (manufacturer of ad cover). Ad shows 3 varieties of footwear, minor edge wear. To Ed. Hogshead, Esq., Gainesville Junction, Miss. with soldier endorsement of “Jn. M. Hogshead, Comp. “G”, 15th Regt. Miss. 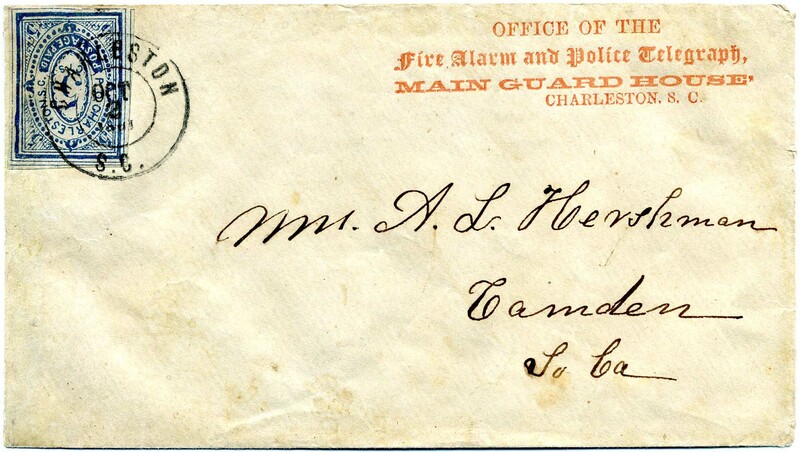 Vol.” At the time of mailing, this was Adam’s Brigade, Loring’s Division, Army of Mississippi. A charming and scarce use from a BRASS BAND musician. $800. John M. Hogshead served in the Grenada Rifles, Capt. W. S. Statham. as a MUSICIAN IN THE REGIMENTAL BRASS BAND. Much more information on the linked page. 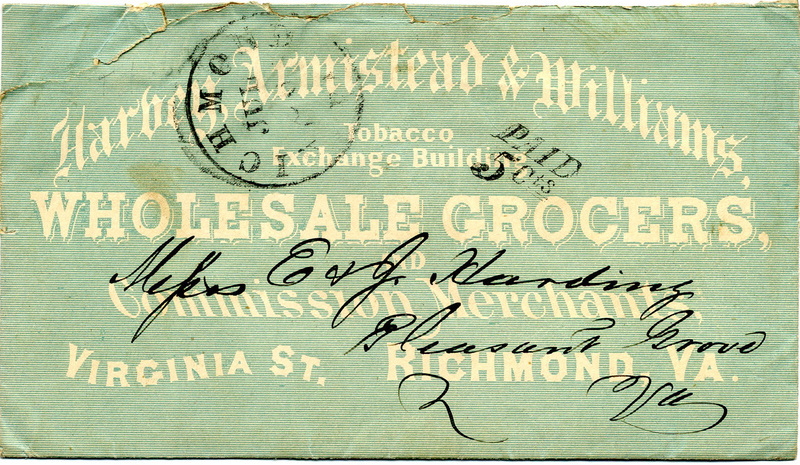 CSA 11, 10¢ blue (3 margins) tied RICHMOND / Va. // MAY / 24 cds on all-over green advertising cover of Harvey, Armistead & Williams, Tobacco Exchange Building, Wholesale Grocers, and Commission Merchants, Virgnia St., Richmond, Va. to Miley C. Wills Esq, Wilmington, Fluvanna County, Va. A Beauty! Ex Dr. D.C. Warren. $700. CSA 11, 10¢ blue (4 margins) tied MARIETTA / GEO. // JUL / 20 cds on all-over gray-brown advertising cover of Denmead & Wright, Agents, City Bank of Augusta, Ga. / General Collectors, Marietta, Ga., addressed in bold ink to Saml. May Esq., Agt. Branch Bk. Tenn. at Memphis, Athens, Ga., top back flap missing, bit of light cover soiling and small erosion hole at top right, Showy, Ex Robert W. Werner and Dr. D.C. Warren. Scarce design. ONLY TWO RECORDED IN BAUM AD CENSUS. $700. CSA 12, 10¢ blue (4 margins, pre-use tears) tied bold blue LYNCHBURG / Va. // MAR /13  cds on cover with letterpress advertising corner card of J. B. Gaddess, Marble Dealer, Lynchburg, Va. / Monuments, Tombs and Gravestones in great variety, always on hand. ORIGINAL MATCHING ILLUSTRATED LETTERHEAD showing lovely arrays of monuments. 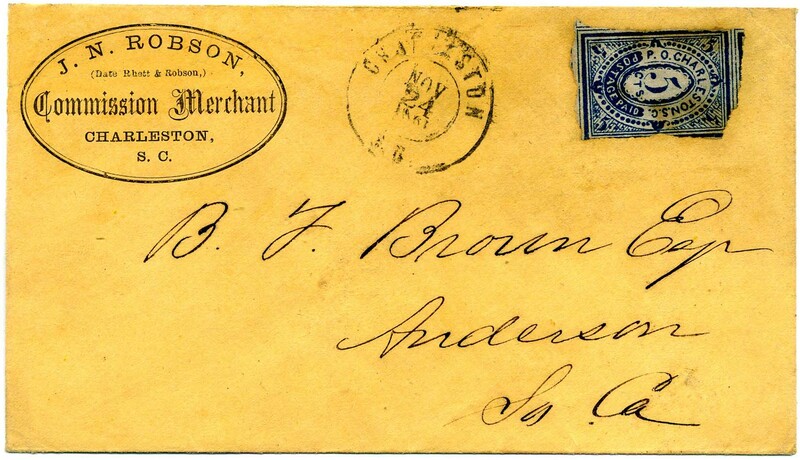 Addressed to J. F. Preston, Abingdon, Va., for marble monument, lettering, boxing and drayage and asking for the amount by return Express. A lovely display page. Ex Dr. D.C. Warren. THIS IS THE ONLY ONE RECORDED IN BAUM AD CENSUS. $750. CSA 11, 10¢ blue tied ATLANTA / Ga. // SEP / 24  cds on letterpress advertising corner card of S.B. 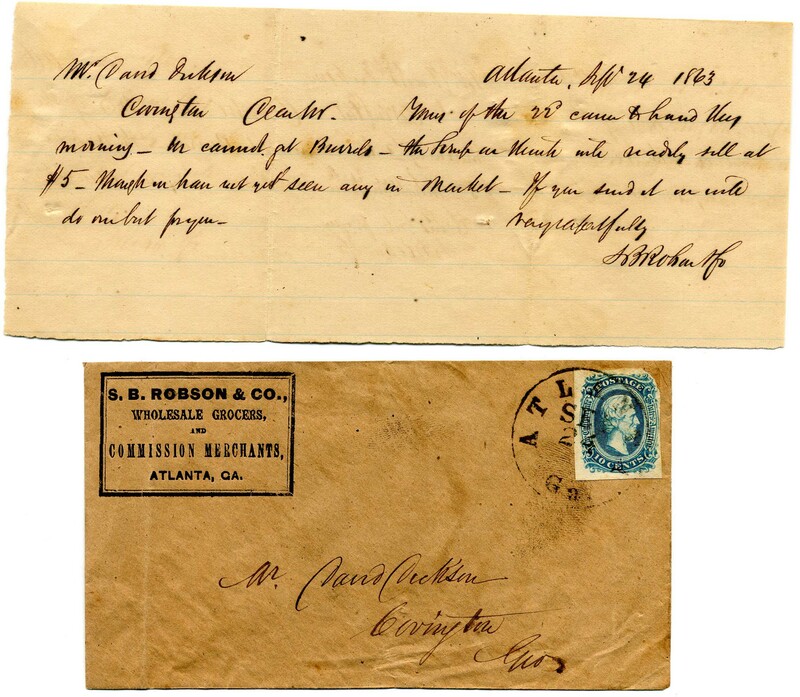 Robson & Co., Wholesale Grocers and Commission Merchants, Atlanta, Ga., to David Dickson, Covington, Geo. 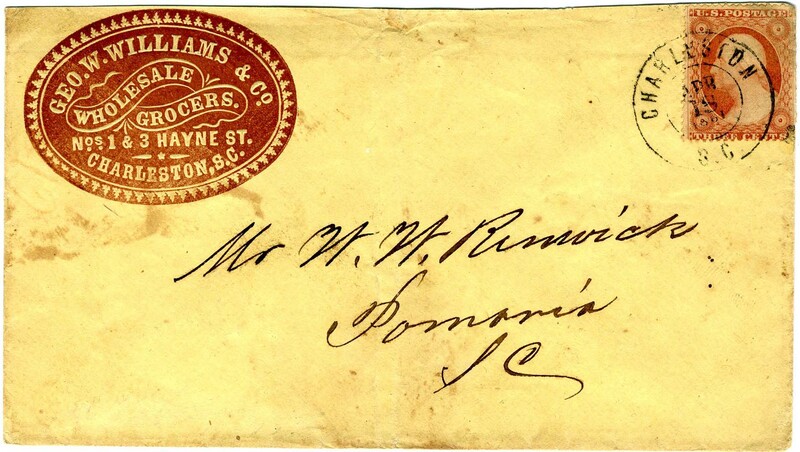 with small original business note from Robson to Dickson; sealed flap tears, Ex Dr. D.C. Warren. ONLY THREE AD IMPRINTS RECORDED IN BAUM AD CENSUS. $300. CSA 11, 10¢ blue (3 margins) tied weakly struck cds of LYNCHBURG / Va. // ? 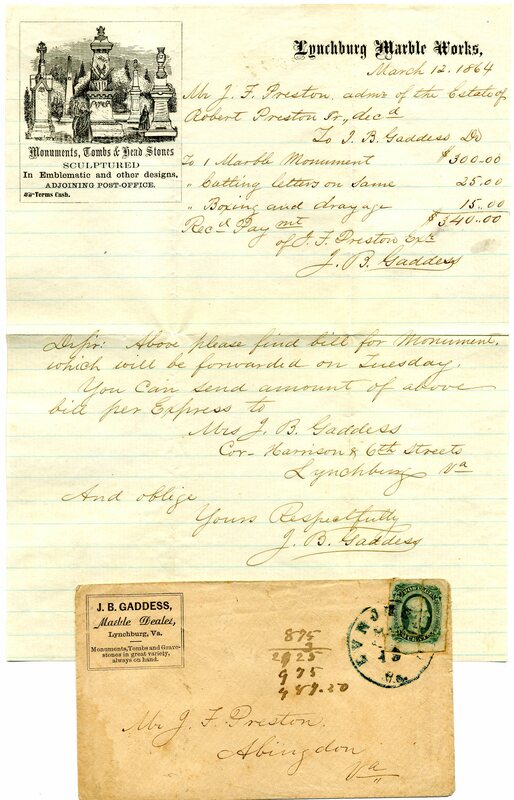 / 18 cds on letterpress advertising corner card of Citizens Savings Bank at Lynchburg, Va., Established 1834, Deposits paid on Demand, Interest 5 percent per anum for Ninety days and upwards, and Four per cent for a shorter time. Capital Stock Permanent and pledged for Deposits $100,000, Surplus Fund, $5,000. 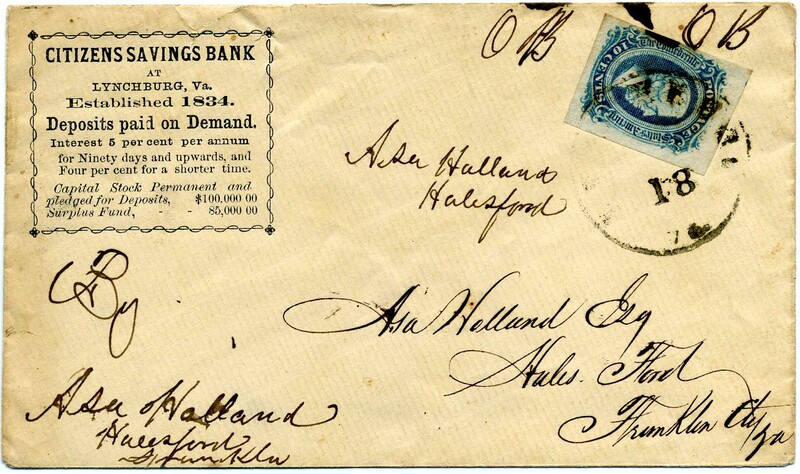 to Asa Holland Esq, Hales Ford, Va. with “O.B.” at top. Scarce ad design. ONLY THREE OF THIS TYPE RECORDED IN BAUM AD CENSUS but this is the only one without a stamp on top of the ad design. Ex Daniel M. Telep and Dr. D.C. Warren. $550. 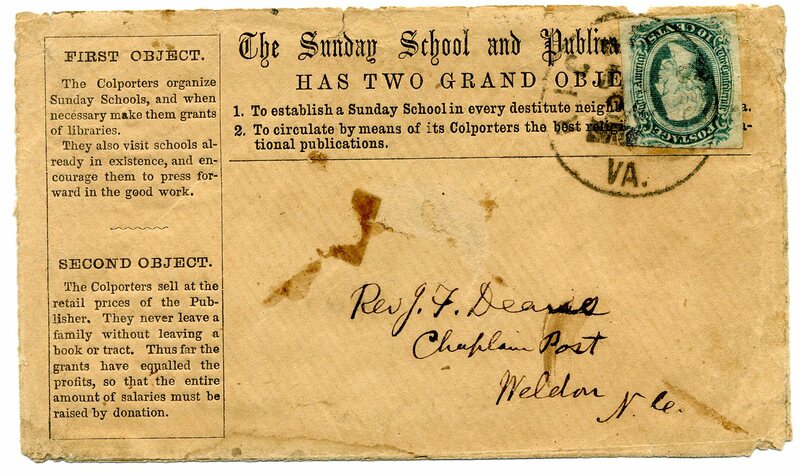 CSA 11, 10¢ blue (3 ½ margins) tied neat RICHMOND / VA. cds on letterpress advertising cover of The Colporters Sunday School and Publications with very lengthy printed messages across the face taking up fully half the cover, addressed to Rev. F. F. Deane, Chaplain Post, Weldon, N.C., TURNED COVER (fully exploded and with envelope faults but none the less flashy and rare. Inside franked with CSA 12c, 10¢ greenish blue tied WELDON / N.C. cds to Miss Sallie E. Wise, Meth[odist] F[emale] College, Columbia, S.C. Upper left corner can be turned to show both stamps but then covers up a good portion of the rare advertising. ONLY TWO RECORDED IN BAUM AD CENSUS. Ex Conrad Bush and Dr. D.C. Warren. $650. 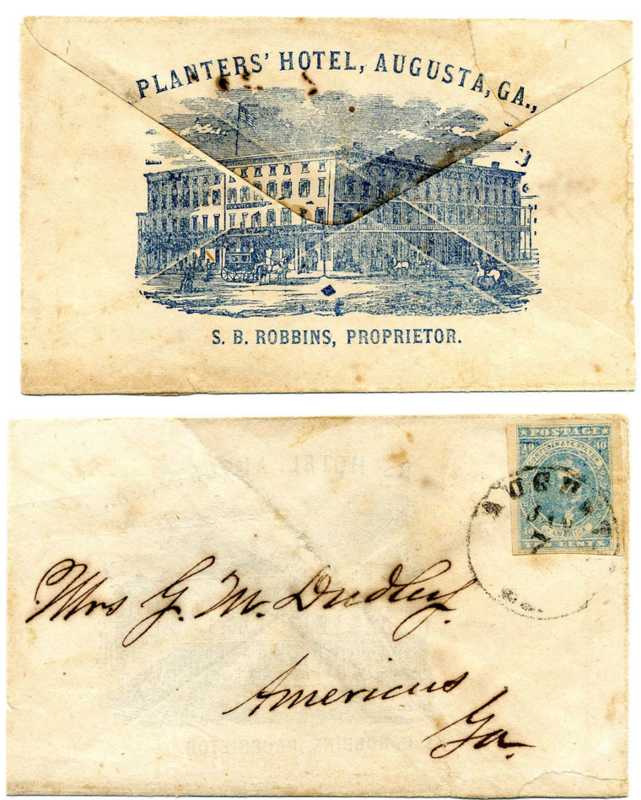 CSA 2-Pa, 10¢ light blue, tied AUGUSTA / Ga. // JAN / 7 cds on cover to Mrs. G. M. Dudley, Americus, Ga, large blue illustrated ad of Planter’s Hotel on verso, large repaired tear through front of exploded cover, slightly reduced at left. $700. 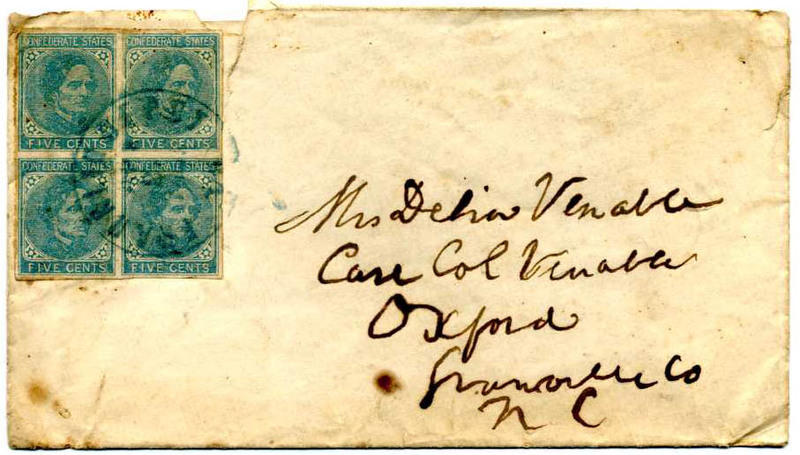 CSA 7, 5¢ blue block of 4 tied on cover with blue FRANKLIN DEPOT / VA cds on cover to Mrs. Delia Venable, Care Col. Venable, Oxford, NC with brown advertising cameo of A. S. Shafer & Co., Clothing Bazaar, Petersburg, Va. on back flap, regrettably torn upon opening and tear extending to front of cover. Scarce use of block and ONLY ONE OF FOUR RECORDED CAMEOS. $400. Abraham Watkins Venable (1799-1876) was a delegate from North Carolina to the Provisional Confederate Congress; and a member of the Confederate House of Representatives, 1862-1864. Much more information on linked page. CSA 7, 5¢ blue pair used with “Mattoax Va / Feby 17th” manuscript cancel on orange overall college cover of Richmond Female Institute (CSA catalog type VA-13, CCV $750) showing college buildings (tiny imprint at LR “Litho. by A. Hoen & Co. Balto”), to “Mrs. 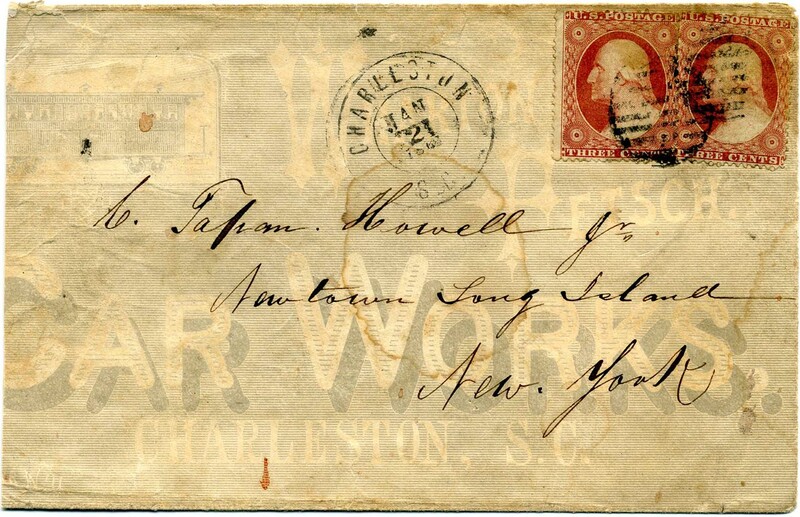 Charles H. Winston, Box 219, Charlotte, NC.” Top back flap missing, slightly reduced at top and tiny sealed edge tears, on verso by Winston, “Get for Wife: 1 qt. Brandy, 1 bunch Yarn.” Ex Fisher. $350. Charles Henry Winston was Superintendent of the Confederate Nitre Bureau, for which he was commissioned a major of cavalry. Much more information on linked page. CSA 7, 5¢ blue vertical pair used with “Chula Depot” manuscript cancel on pale orange overall college cover of Richmond Female Institute (CSA catalog type VA-13, CCV $750) showing college buildings (tiny imprint at LR “Litho. by A. Hoen & Co. Balto”), to “Mrs. 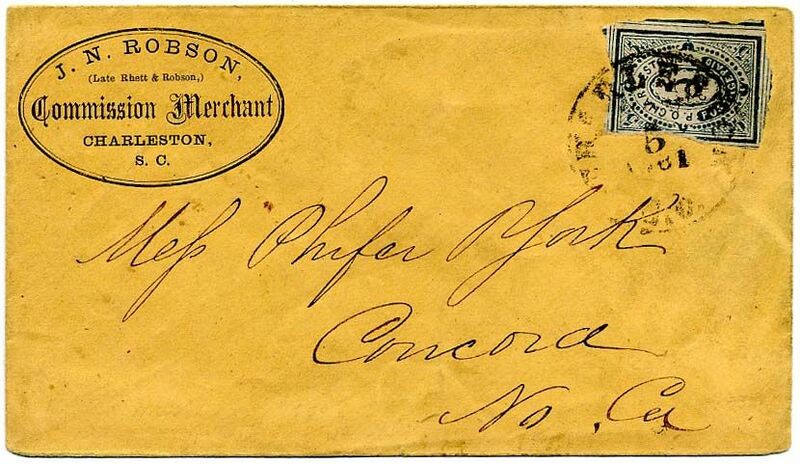 Charles H. Winston, Box 219, Charlotte, NC.” $350. CSA 5 variety, 10¢ deep rose (4 large margins), tied RICHMOND / Va. // JUL / 9 / 1862 cds on Colporter's Sunday School and Publication Board advertising cover to Mrs. Peter B. Law, Care Rev. C. C. Chaplin, Danville, Virginia. Interesting objectives described in the text; vertical crease in cover is slightly worn and soiled but does not affect stamp. Showy Advertising Cover. Ex Walcott, Hall, and Kilbourne. $3,000. Adams Express Company, S. Western Division, Augusta, Ga., blue all-over illustrated shaded ad cover showing Street View of Office, addressed to Adams agent “J. P. Hawkins, Esq., Agent, Danville, Va.;” reduced at right, otherwise Very Fine, ex-Knapp, Emerson, Shenfield, Wiseman, Mayo and Hart. $900. 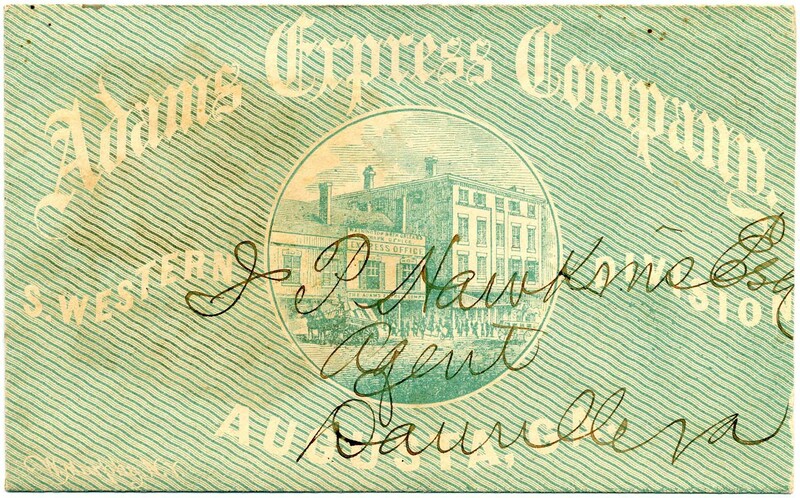 J.P. Hawkins worked for Southern Express from at least 1862 to May 1865. General Orders No. 77 exempted Southern Express employees from conscription. Much more information on linked page. 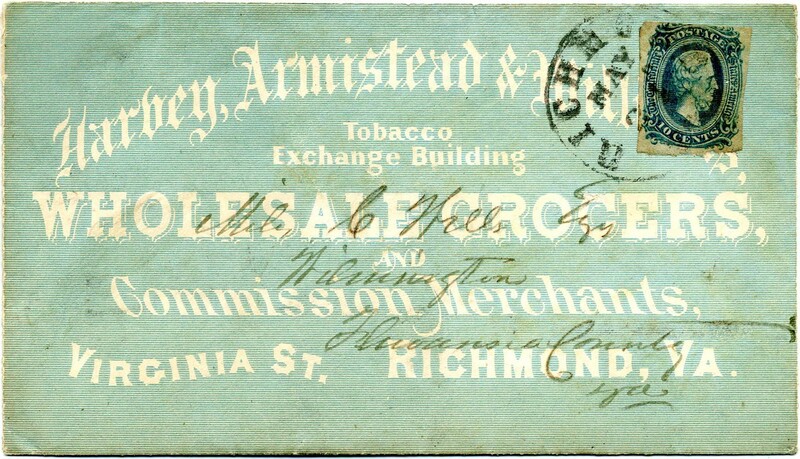 CHARLESTON / S.C. // DEC / 7 / 1861 cds with matching PAID 5 handstamp on gray all-over illuminated ad cover of Chambers, Barnes & Co., General Commission Merchants, Charleston, S.C., to A. B. 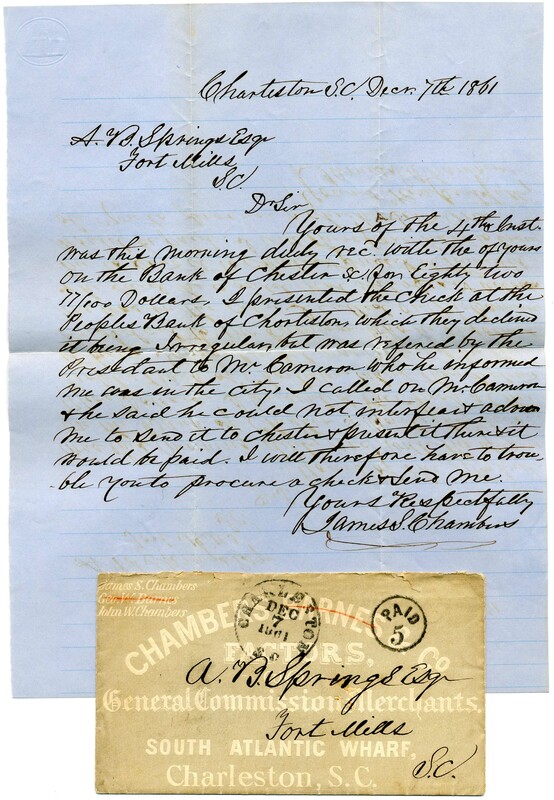 Springs, Esq., Fort Mills, S.C.; Barnes crossed out in red crayon, original enclosure accompanies concerning difficult in cashing checks from one bank to another; small edge tear, otherwise Very Fine, Ex Littlejohn, Mayo. $550. Major Andrew Baxter Springs enlisted in the Confederate Army, but because of age he was sent home. Much more information on linked page. 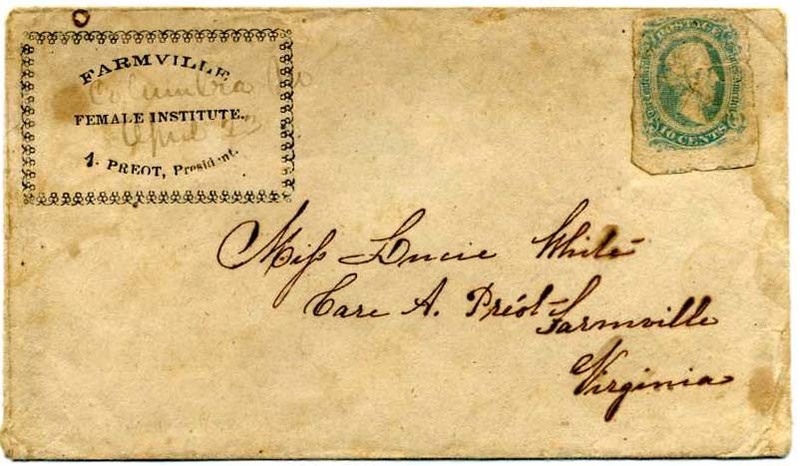 CSA 4, 5¢ blue used with FARMVILLE / Va. // MAY / 23 / 1862 cds and grid which barely ties the stamp, on all-over gray illuminated envelope of FARMVILLE Female College (CSA catalog #VA-09c, CCV $1,000) addressed to Mann Valentine, Jr. Richmond, Va., small sealed edge tears and top back flap faults not mentioned on 1977 CSA certificate, Ex Hall. $700. Mann Satterwhite Valentine, Jr. biographical information on linked page. US 26, 3¢ dull red (repaired) with lightly struck GHOLSON / MISS. 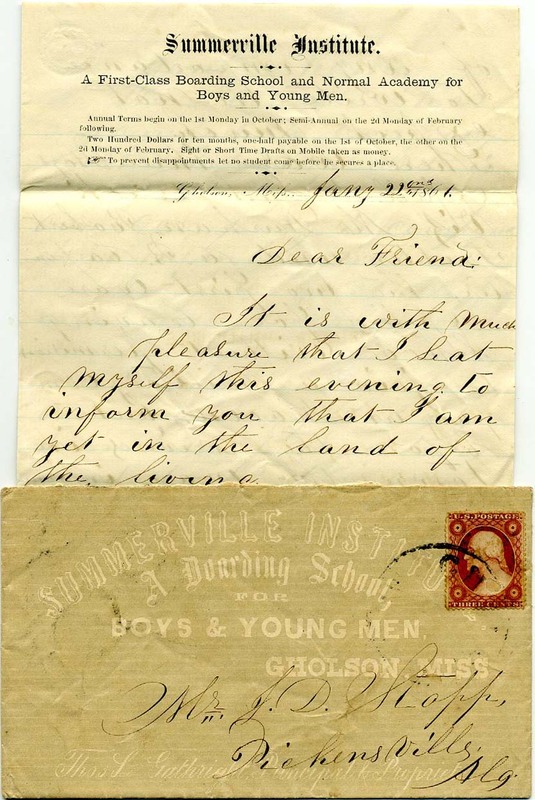 balloon postmark on all-over SUMMERVILLE INSTITUTE college cover “A Boarding School for Boys & Young Men, Gholson, Miss.” with MATCHING LETTERHEAD and excellent historic 3-page letter, addressed to Mr. J. D. Stopp, Pickensville, Ala., from A[rthur] P. Fort. UNLISTED INDEPENDENT STATE USE. Flaps faults. Spectacular matching pair. He talks about boys being expelled for leaving school without permission to join a military company and then find they were turned away because they had more volunteers than guns. The students organized their own company composed of 51 members and “we are making a great display with our military tactics.” $1,250.